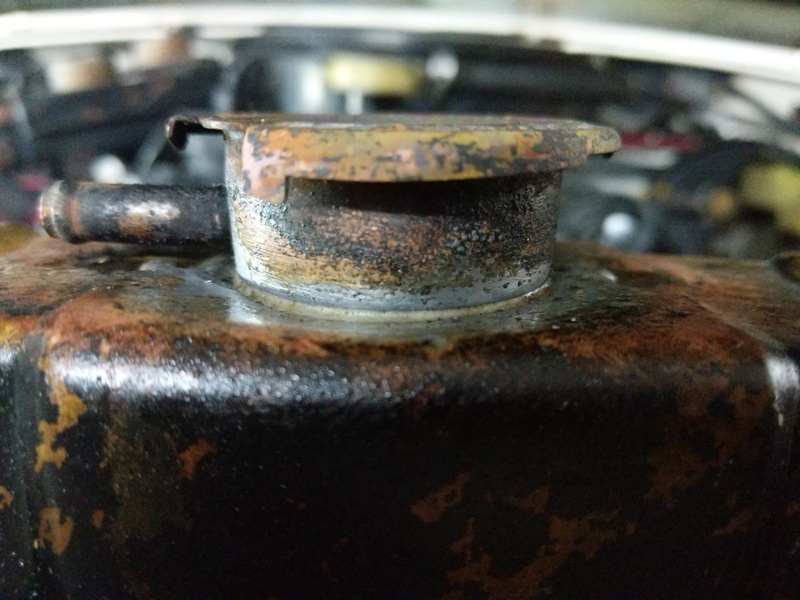 A common issue with Grand Wagoneers is rusting gas tank skids. Gas tanks on Wagoneers are plastic. 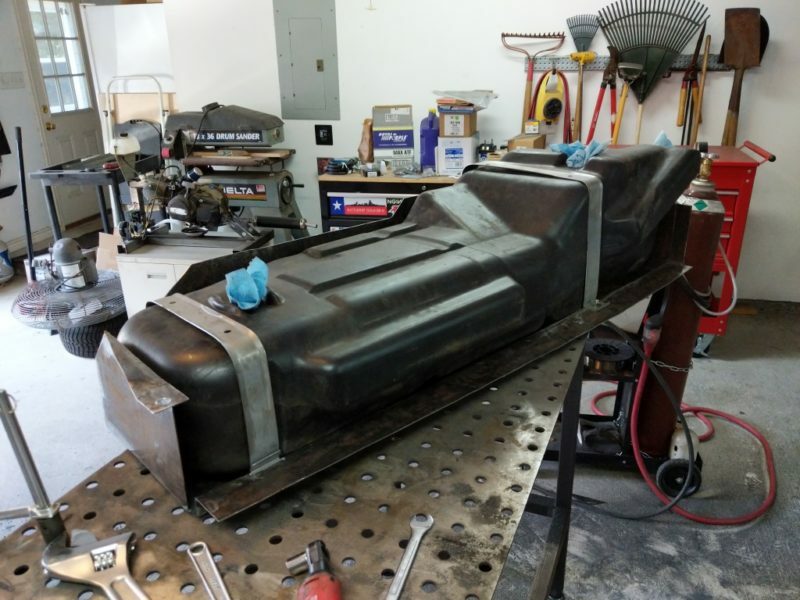 To support the weight, the gas tanks are fastened to a metal skid. Then the skid is bolted to the frame. 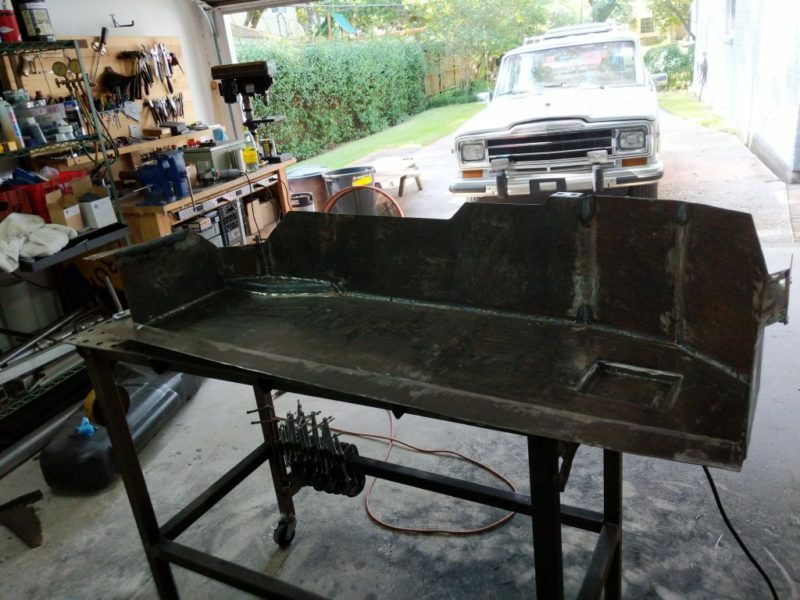 This is a great setup as the gas tank can not rust out and clog fuel filters but Jeep made the skid plates out of thin metal with poor rust prevention so they do not last. 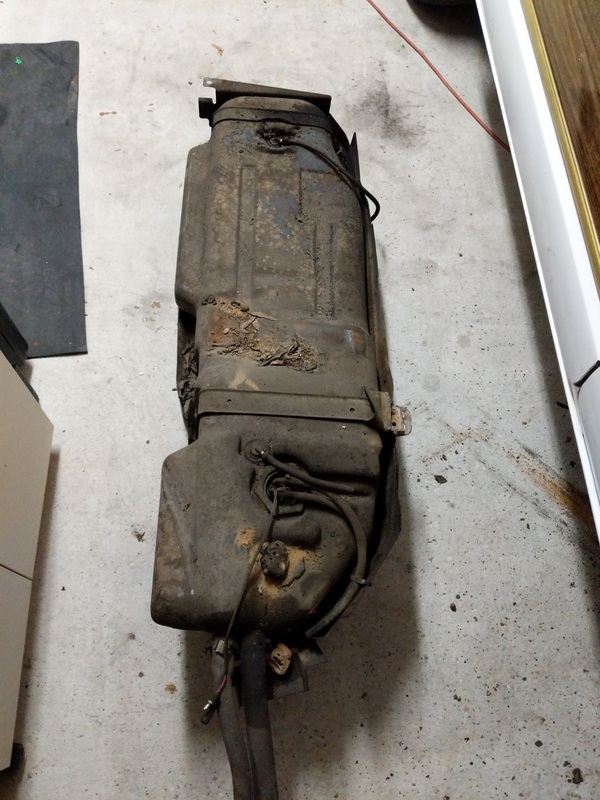 Pulled gas tank out of the wagon. Dirty! I disconnected the fuel lines and fill lines then dropped the tank. Skid is full of dirt and rust. The straps that hold the tank to the skid where rusted through so removing the tank from the skid was easy. I then inspected the frame where the gas tank lives. This is also a very common area for rust to happen. This looks bad but the frame was 100% intact. There was ton of dirt build up on the frame that at first looked like rust. 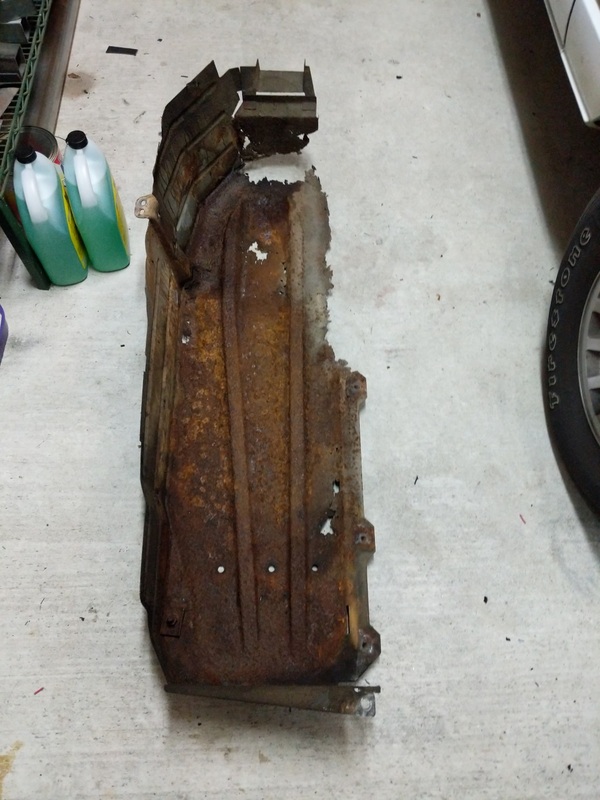 The rusted holes in the left side of the picture is left over parts of the skid plate that was still attached to the frame. 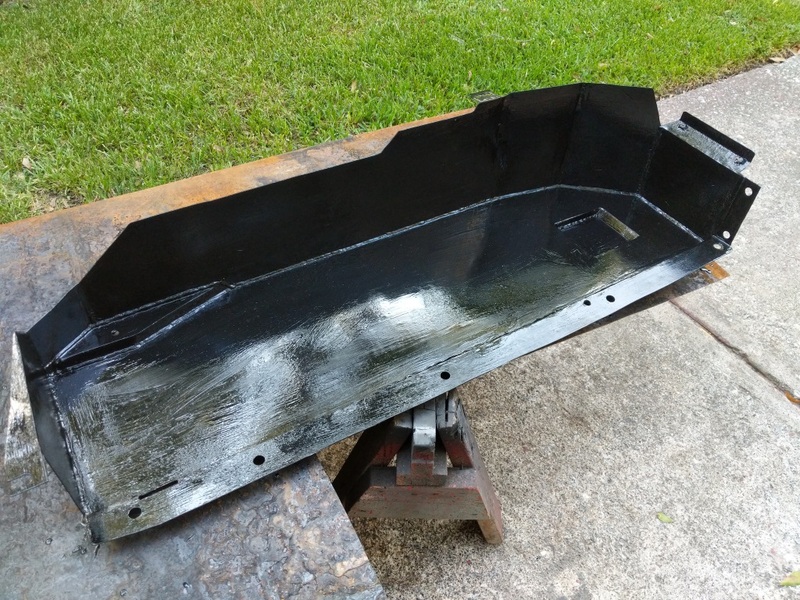 I cleaned up the frame and painted it with some chassis saver to prevent any further rust. 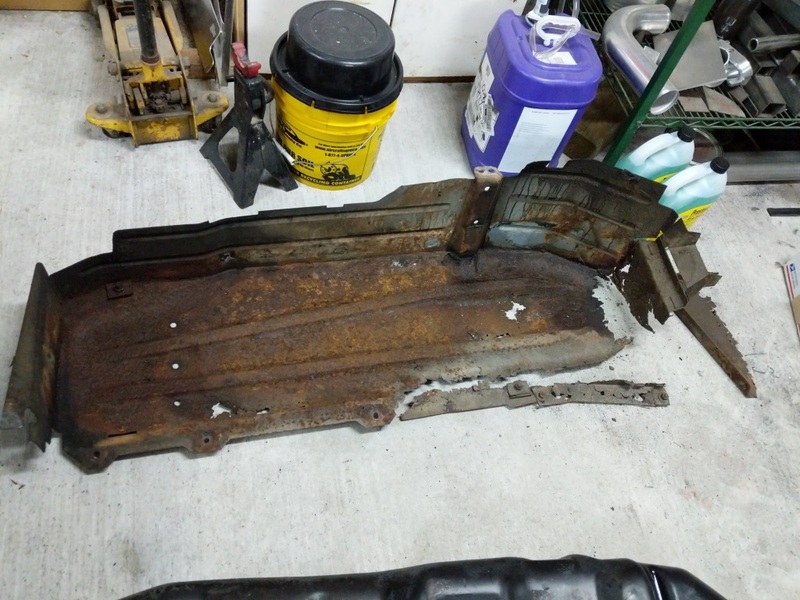 Skid plate cleaned up after removal of gas tank. 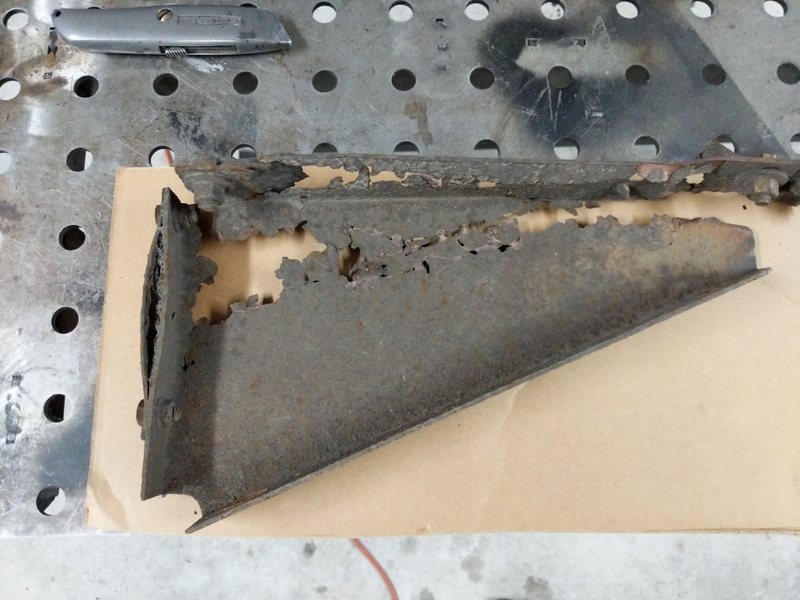 Then I cleaned up what was left of the skid plate. I was hoping to repair the skid by patching it but the skid was to far gone at this point. 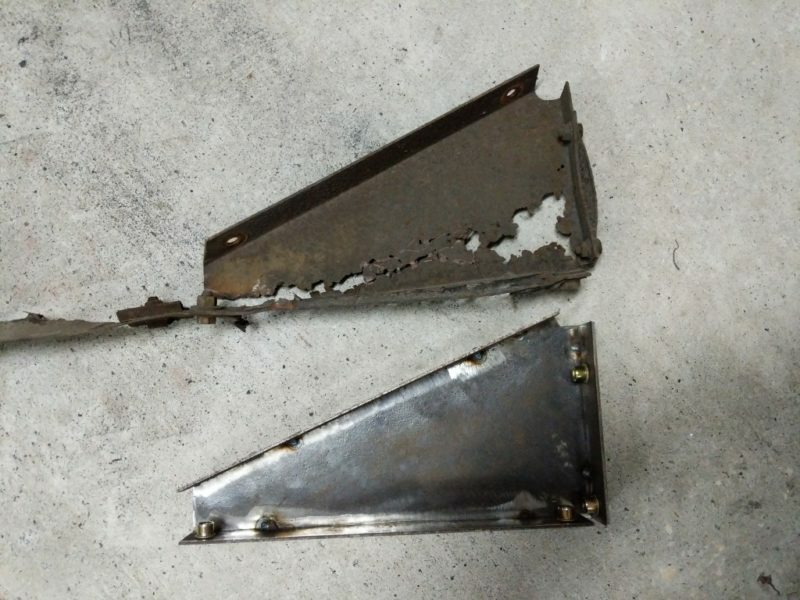 Skid plate triangle brace. Not much left of it! 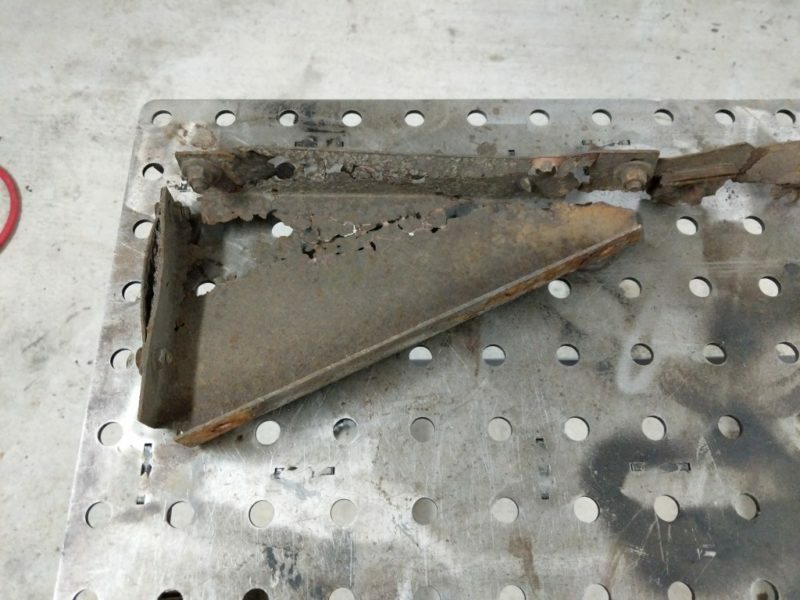 Then pulled the skid plate triangle brace and cleaned it up. Swiss cheese steel. I decided to rebuild the triangle brace first since it will be easier. Brackets for the triangle brace. Built the new bracket parts for the triangle brace. I added nutserts to make install easier later. Tracing the old brace into cardboard. Testing fitting the brackets and cardboard cutout. 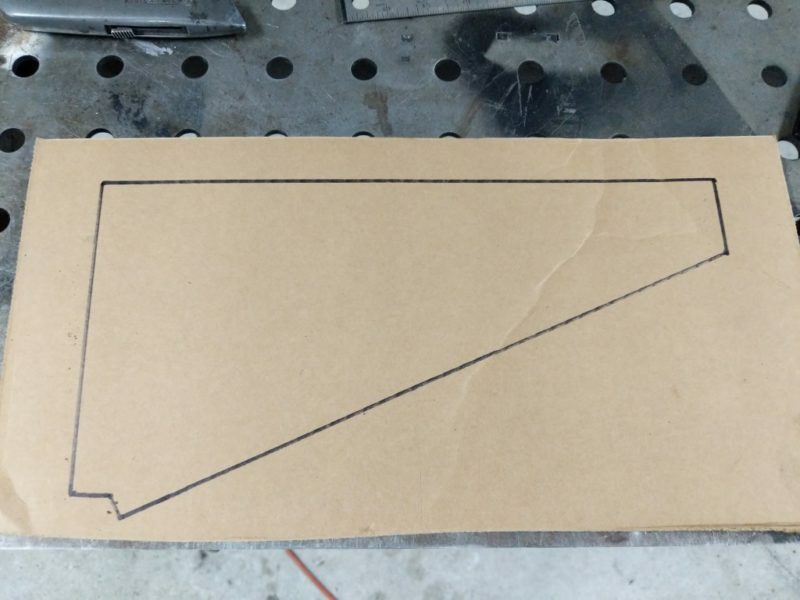 To make the rest of the triangle brace, I traced it onto some cardboard. 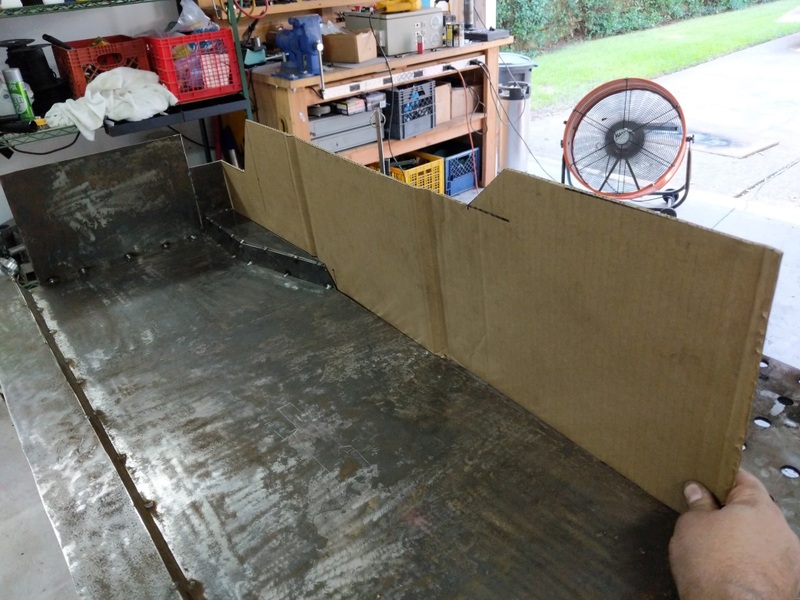 Then I cut out the cardboard and mocked it up with the braces I cut out steel. 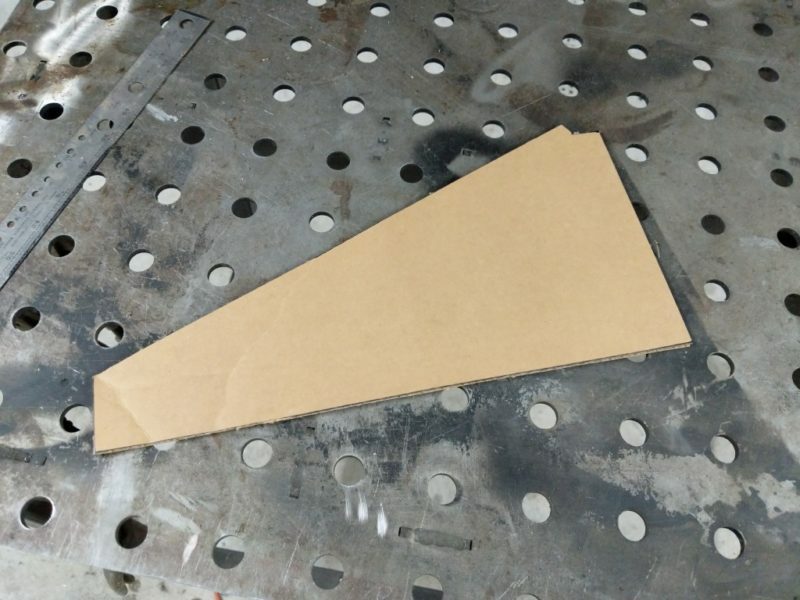 Cardboard template transferred into steel. 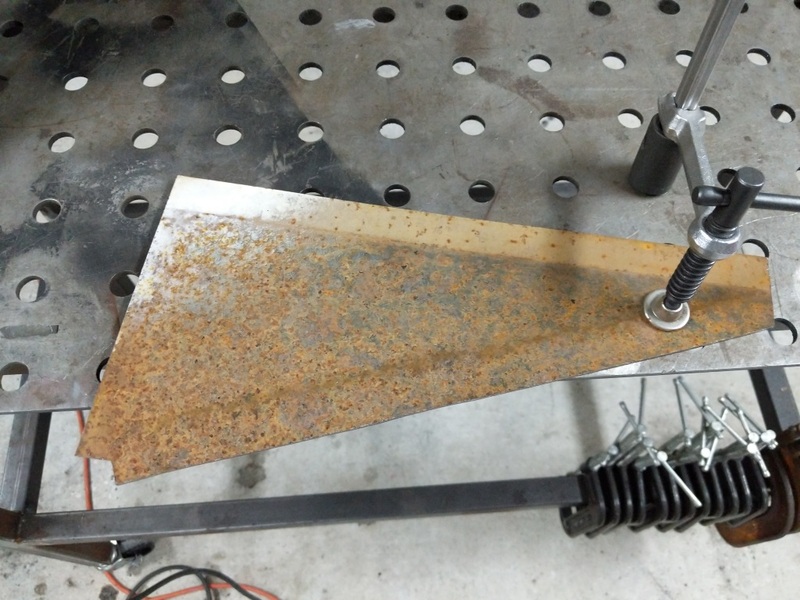 Steel cleaned of rust and scale. Then I copied the cardboard into some 14AWG steel. The steel was bought LTP (Less Then Prime) which means it is rusted but it was inexpensive. Cut the steel out and then cleaned up with a flappy disc on the grinder. 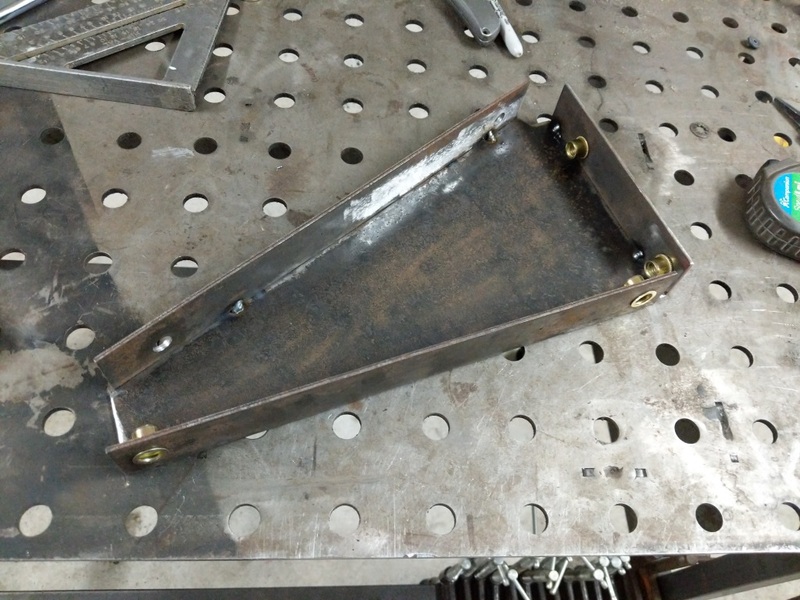 Brackets tacked to the steel triangle. Comparing the original rusted bracket to the new one. 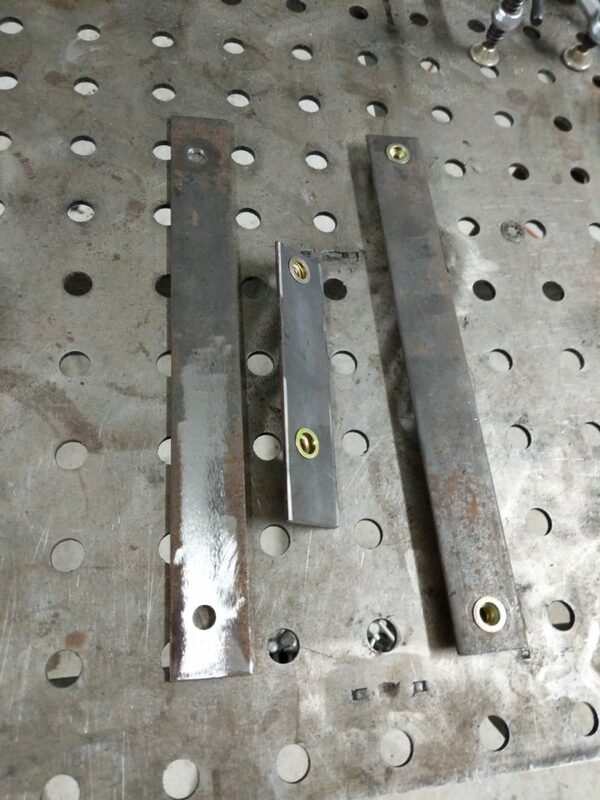 I then tacked the brackets onto the steel and compared it to the original bracket. Looks good to me! Outside welded and grinded smooth. Inside welded. New bracket complete! 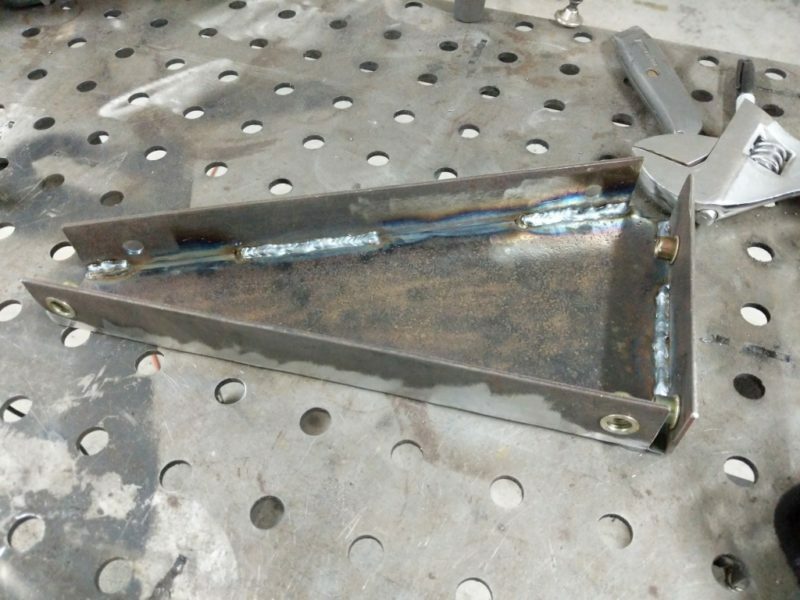 Triangle brace is complete. 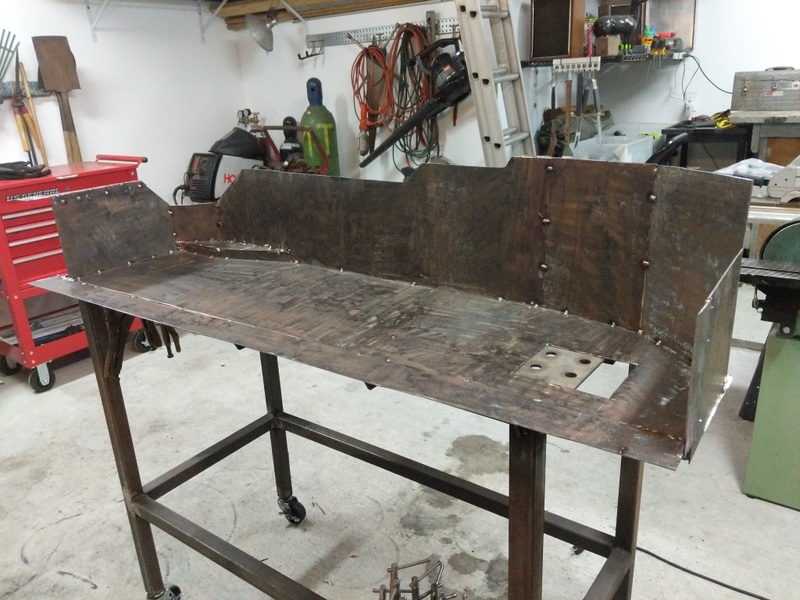 Time to start fabricating the skid plate for the gas tank. 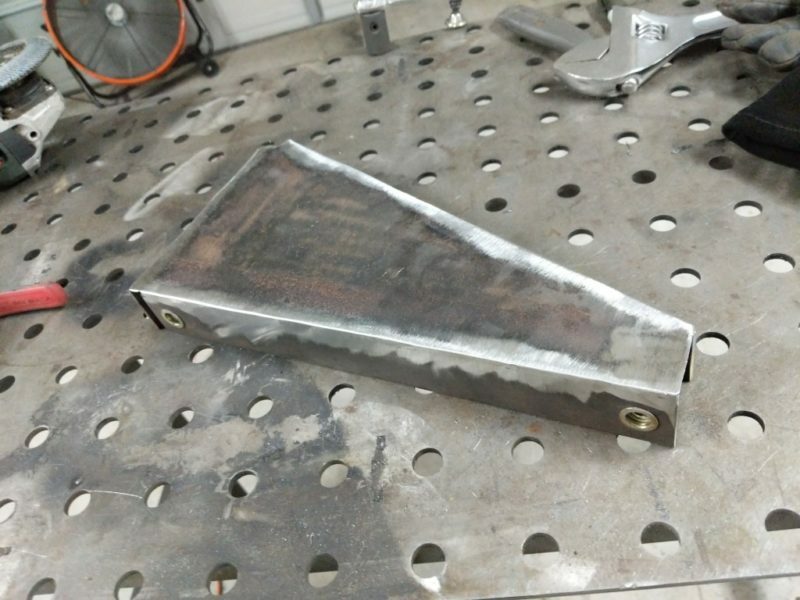 Skid plate pieced back together for measurements. 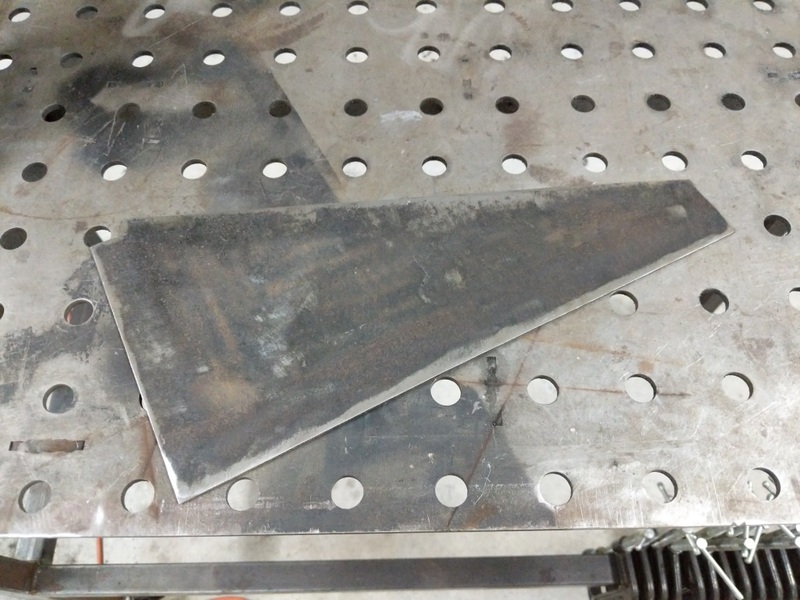 I started measuring the skid plate and started cutting some steel. 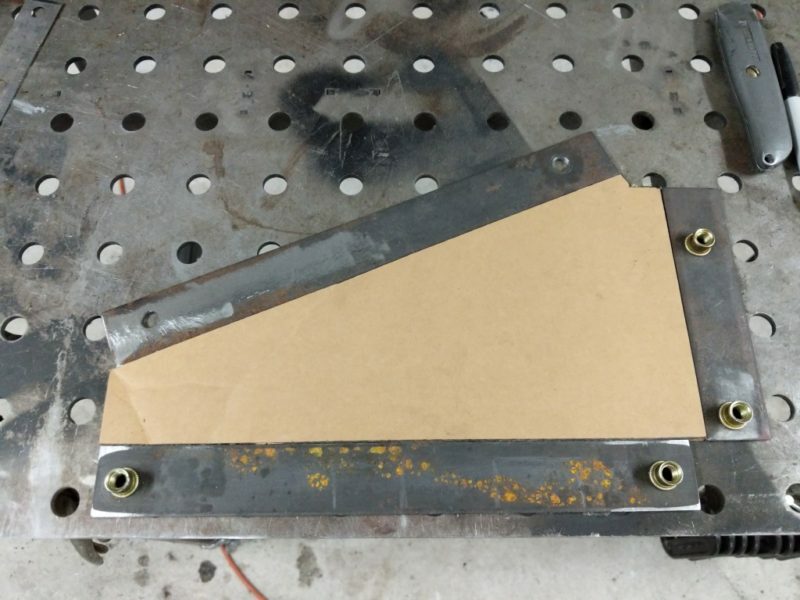 Skid plate construction. Checking fitment. This is my construction technique. Measure, make cardboard cut out, test fit, cut out of steel, and tack up. More test fitment after making the large side panel. Other side of the large panel. Rest of the side panels cut out and tacked up. The gas tank has a lower bulge for the gas pickup. Made a drop down section and fitted up some steel to cap it. 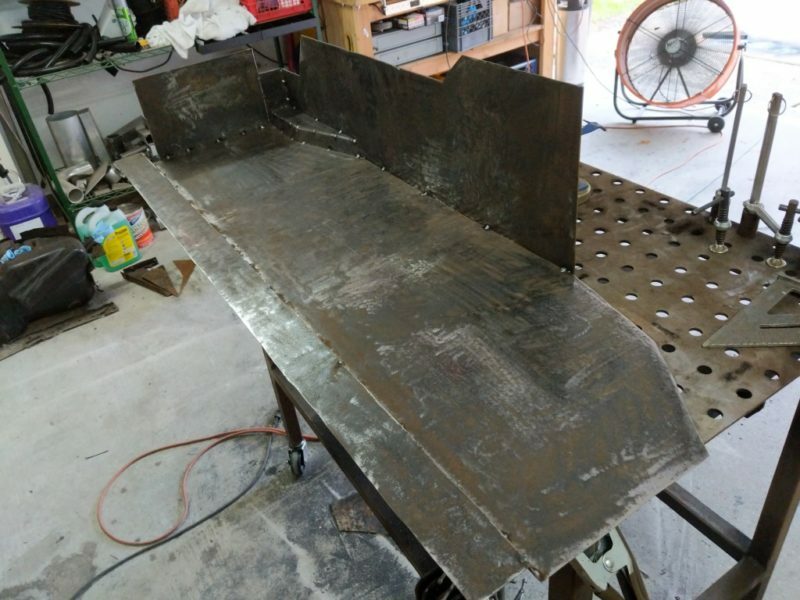 Skid plate seam welded and grinded. Lots of metal dust. My respirator was completely black after this. Wear your PPE people. 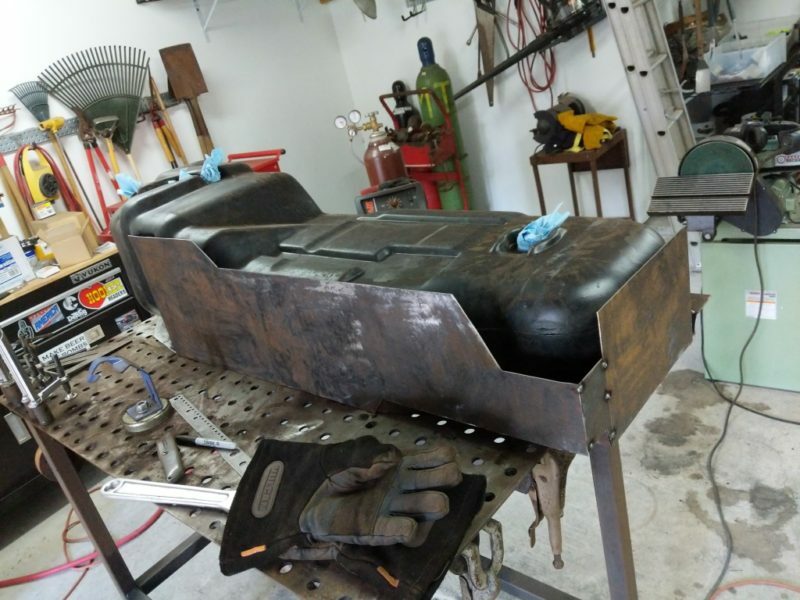 Test fitting the tank with the gas tank straps. 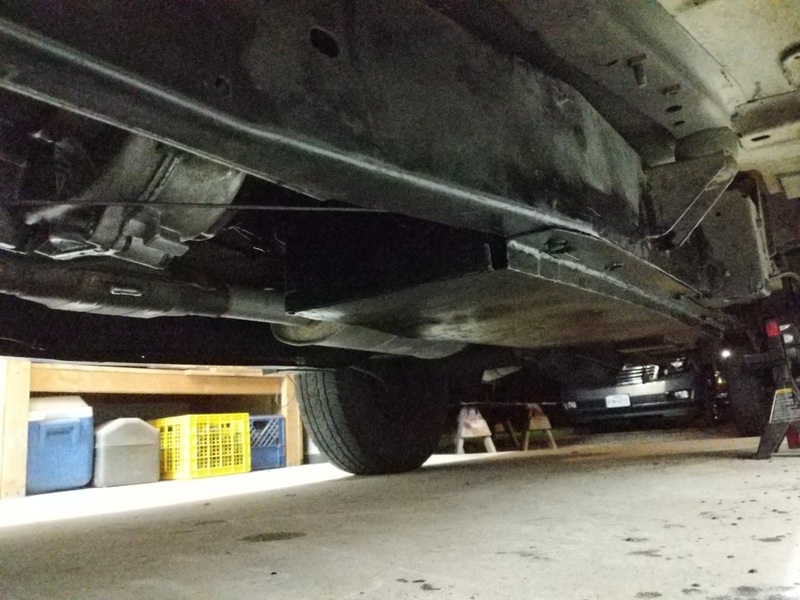 Painted the triangle bracket, skid, and associated brackets in chassis saver to prevent rust. 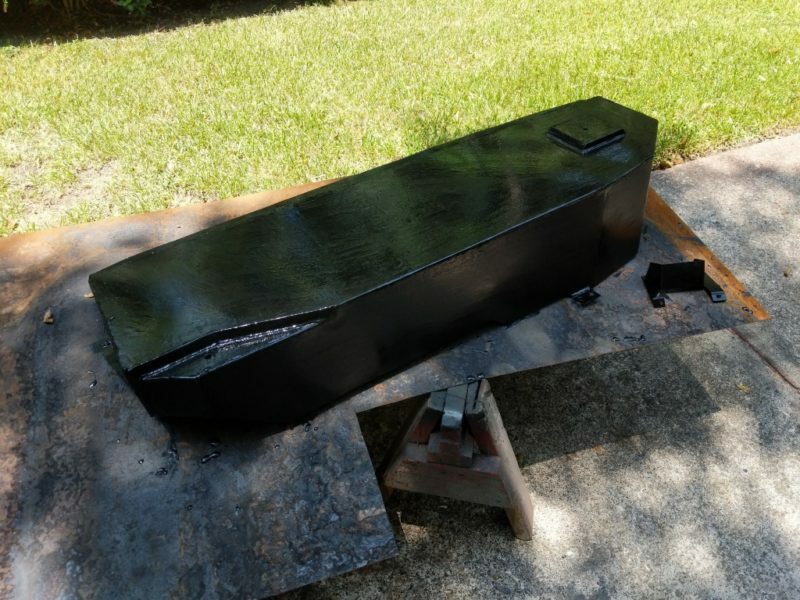 Bottom side painted. I drilled holes in the skid for water drainage as you can see here. Gas tank fitted, vent lines plumbed, and fuel sender installed. 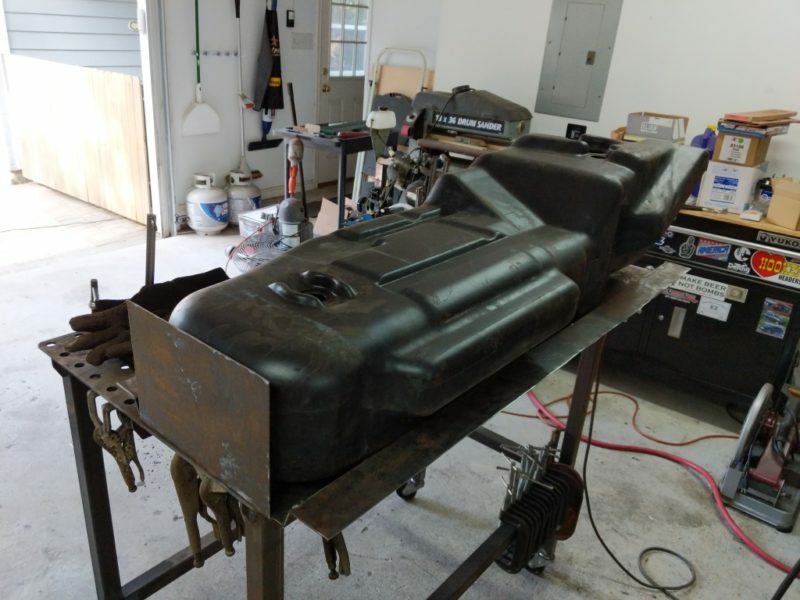 With the skid plate and triangle bracket fabricated and painted I installed the gas tank. Before that I cleaned out the gas tank with a pressure washer and dried it out. 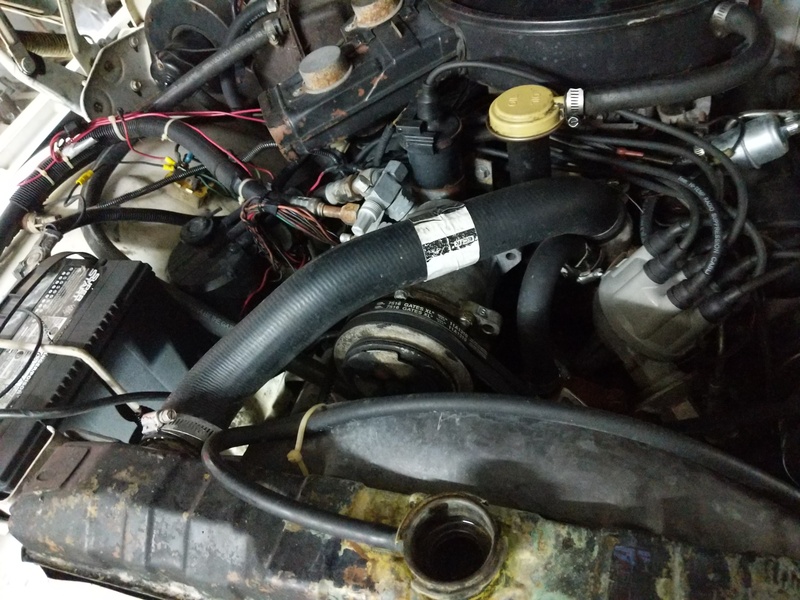 Then the gas tank received new gas tank straps, vents, vent hoses, and sending unit. Gas tank with new skid installed under the wagon! I then installed the skid under the wagon. Fit great and now I do not have to worry about the gas tank falling out. Time to start fixing things on the Wagoneer. It drives around town fine but when the engine is turned off after driving it tends to puke radiator fluid everywhere. 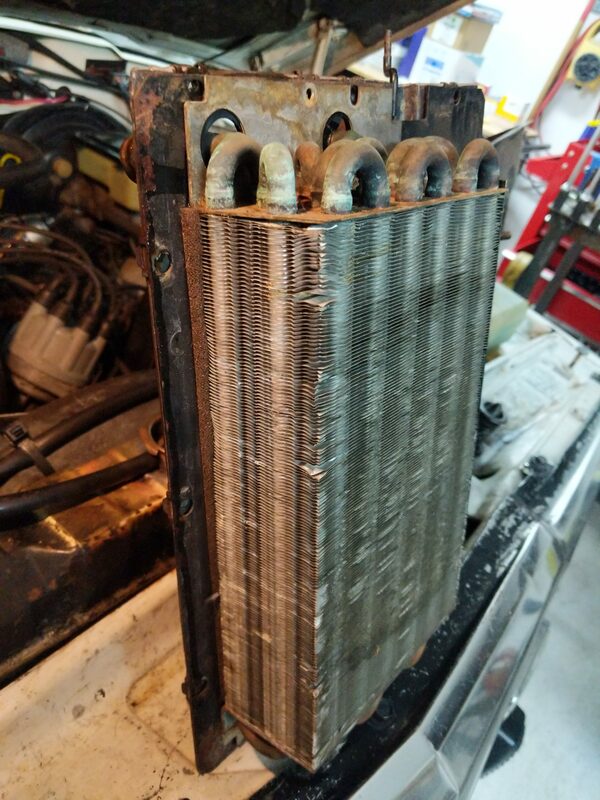 Looking at the radiator it is clear this happens around the filler neck. Wiggling the filler neck it looks like there is a crack at the base. Since this is a brass/copper constructed radiator I should be able to braze/solder this back together. 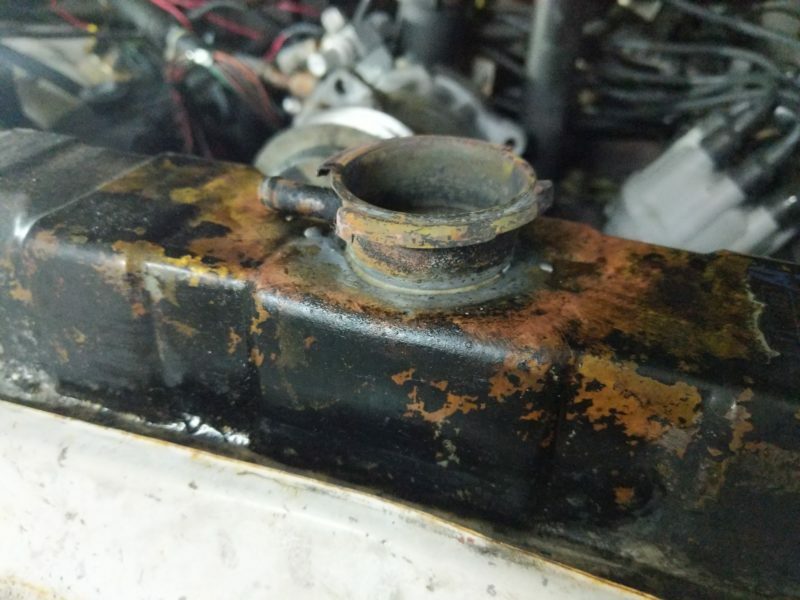 Radiator filler neck with lots of radiator fluid (glycol) crusted around it. 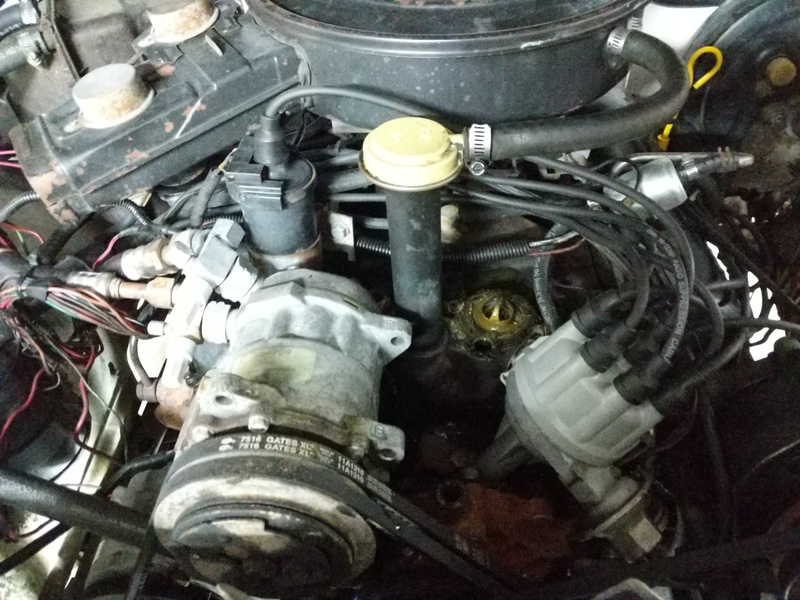 While I am in here I am going to also replace the T-Stat, water pump, and clean up the heater box. Basically a cooling system rebuild. Radiator peacock. 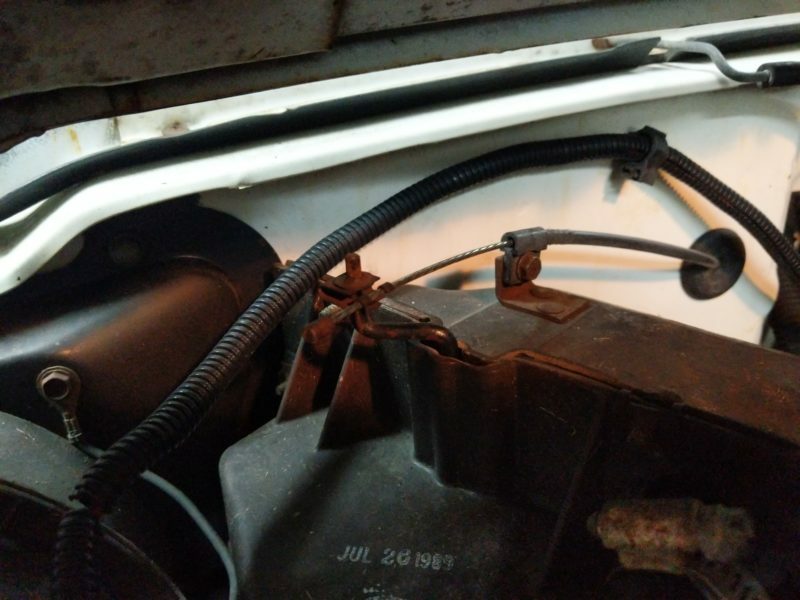 I zip tied the transmission lines out of the way so the coolant can flow without hitting anything. Draining all the coolant. On the Wagoneer the drain peacock is at the bottom which is nice. On the TJ Jeep it is horizontal and tends to shoot coolant all over the steering suspension. 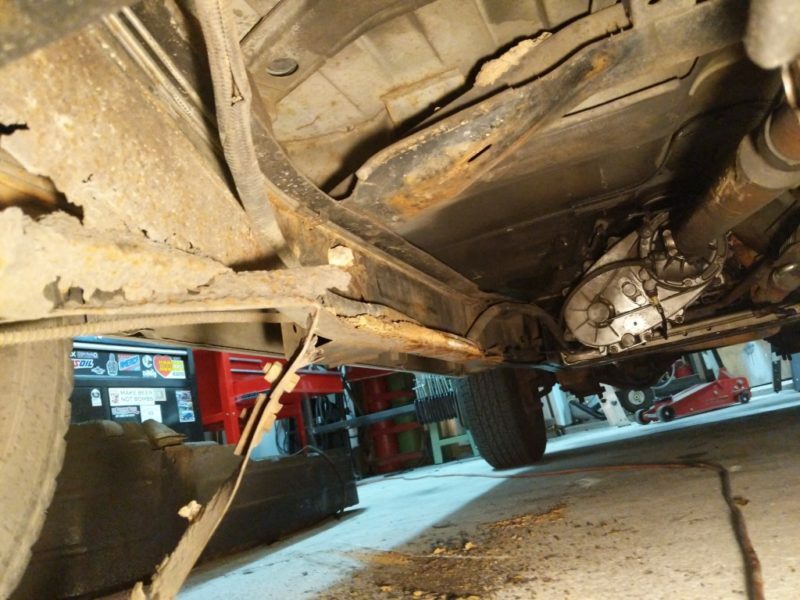 Only thing in the way was the two transmission fluid lines which I was able to zip tie out of the way. With the fluid drained I removed all the hoses in the system. 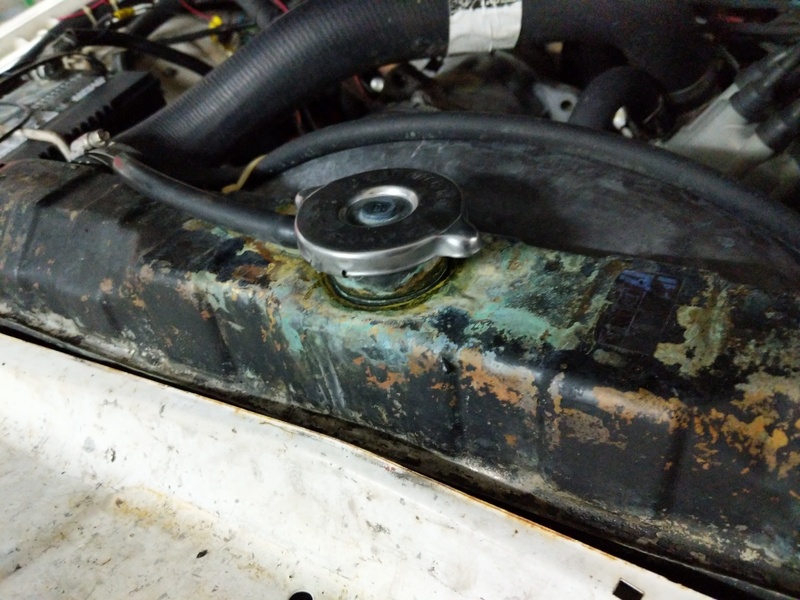 There are three that attach to the radiator; Upper radiator hose, Lower radiator hose, and the hose that goes to the overflow bottle. I inspected these as I removed them and they looked to be a in shape and I will be reusing them. I pulled the T-stat housing and it looks like it belongs on the Titanic. I will clean this up with a brass wire wheel on the drill before reinstalling. T-stat is installed upwards. Lots of gunk on the T-stat as well. The T-stat itself sits in a grove on the block and the gasket is put over it. 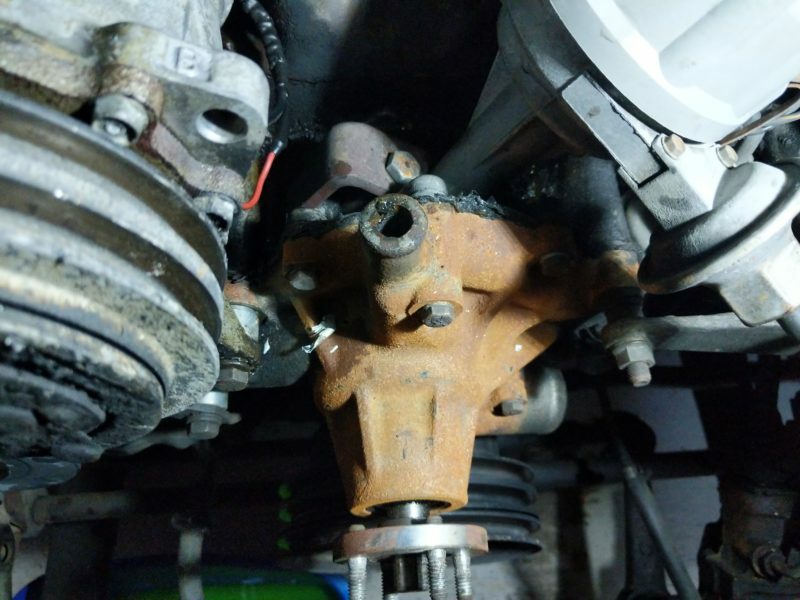 The previous mechanic just gooped RTV all over it and was a pain to remove. Close up of the T-stat. Nasty. Not much left of the original gasket. Lots of rusty sludge build up on it as well. 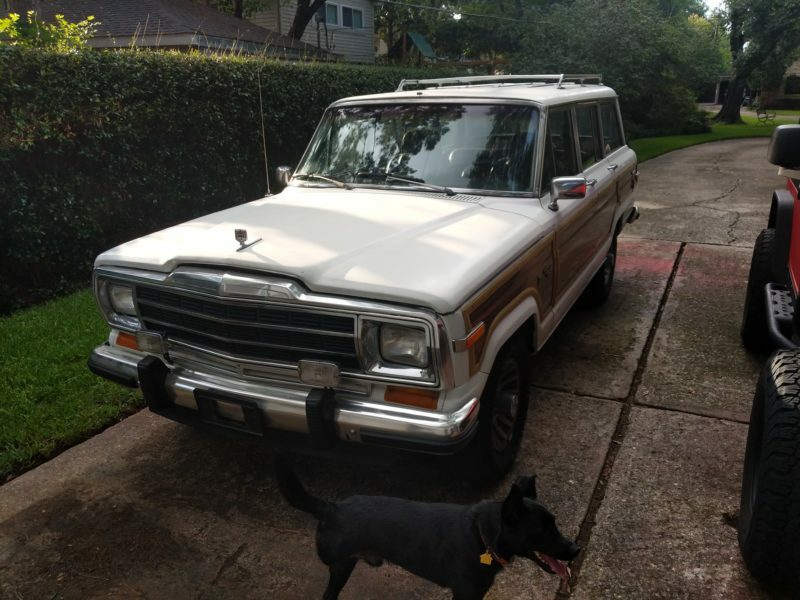 Makes sense that the Wagoneer sat for years before I got it. 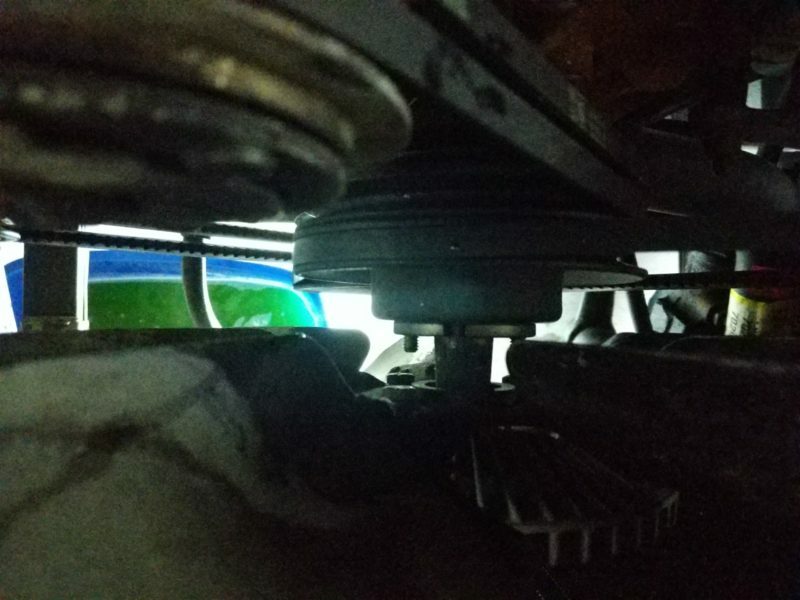 Removing the fan and fan clutch. 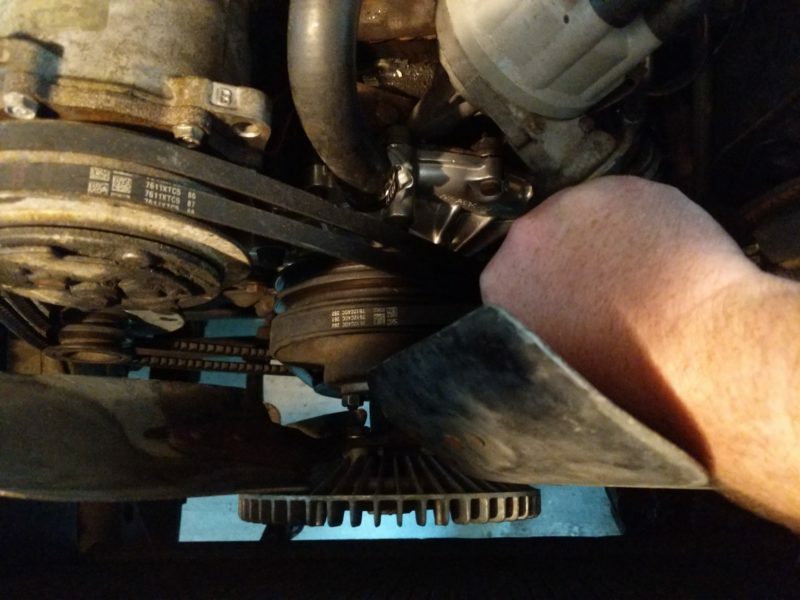 At this point it makes sense to make more room to work by removing the fan clutch. 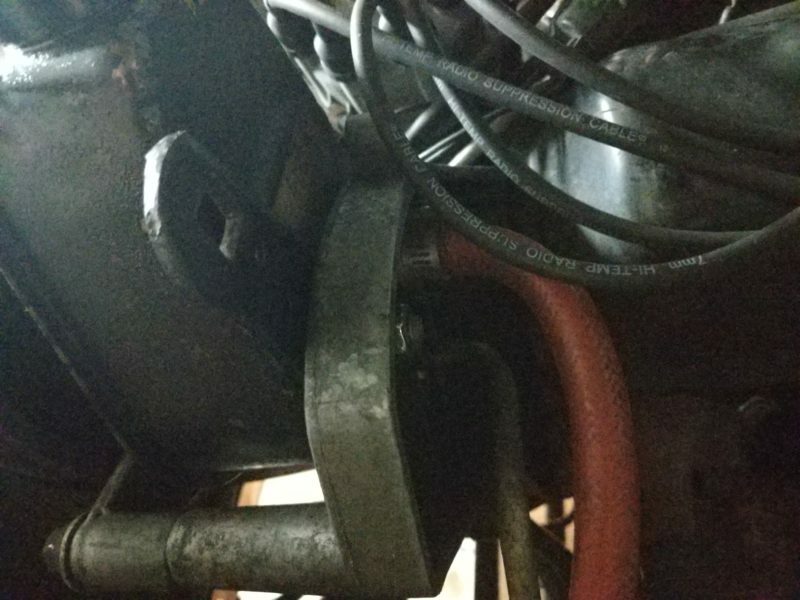 Since the belts are still installed it makes it easy to remove the 4 bolts on that hold the fan clutch to the water pump. 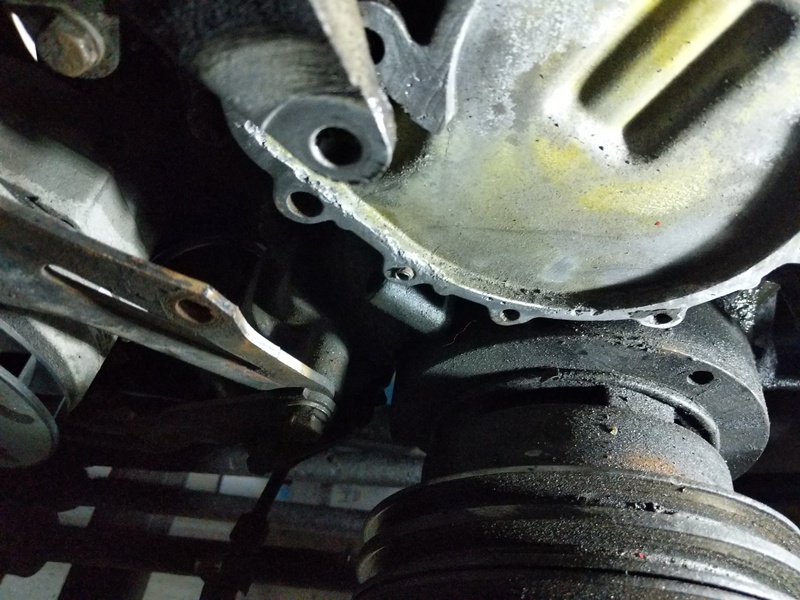 Nut/Bolt that adjusts the tension on the power steering pump belt. Nut/Bolt that adjusts the tension on the alternator belts. Next I removed the belts. There is a nut on the bottom of the alternator that will need to be loosened. Doing so allows the alternator to swing inwards loosening the belt. A nut on the back of the power steering pump does the same thing. Power steering pump belt part number. 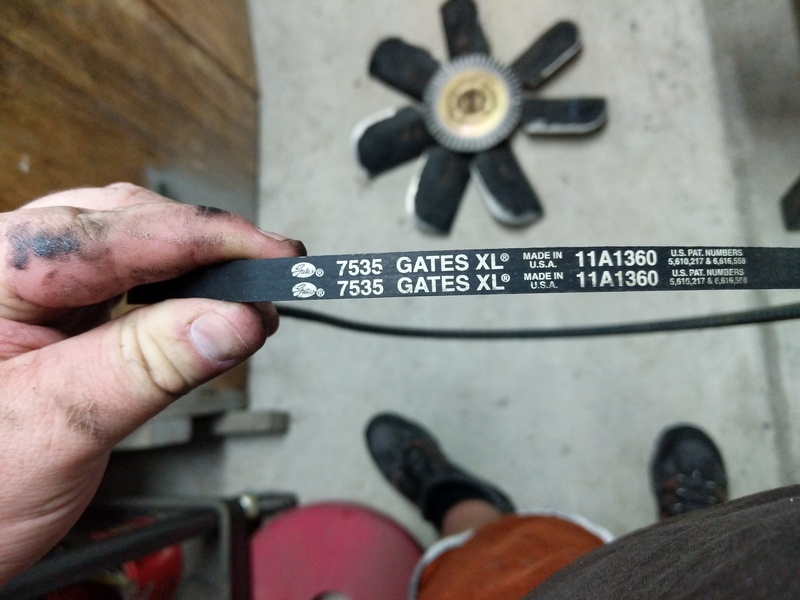 Alternator and A/C compressor belt part number. I wrote down the part numbers in case I need more belts. The belts look fairly new so I am going to reuse them. 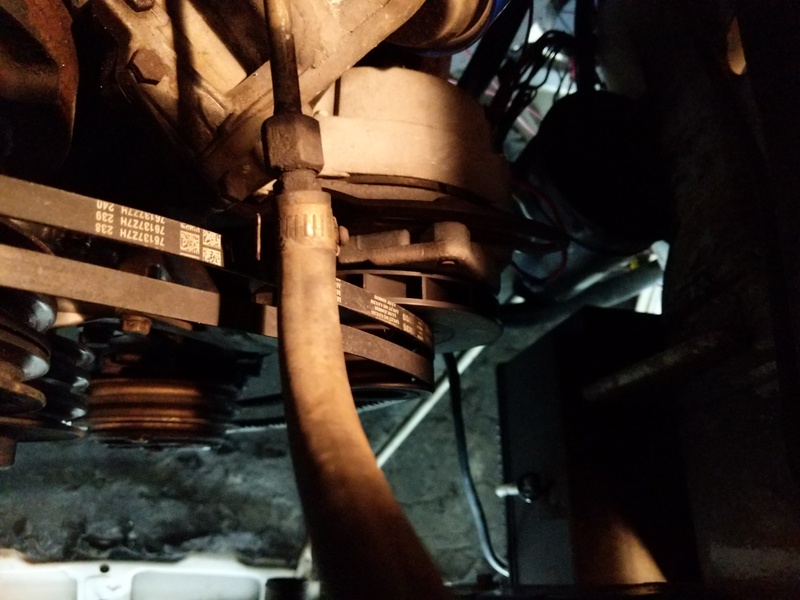 With the belts removed I pulled off the water pump pulley to get a good look at the pump. Oh boi, previous mechanic RTV the pump on with Black RTV. Gonna be fun to remove. There are lots of bolts on this thing and brackets that attach to other accessories. I removed all the bolts and laid them out in order of how they came out. 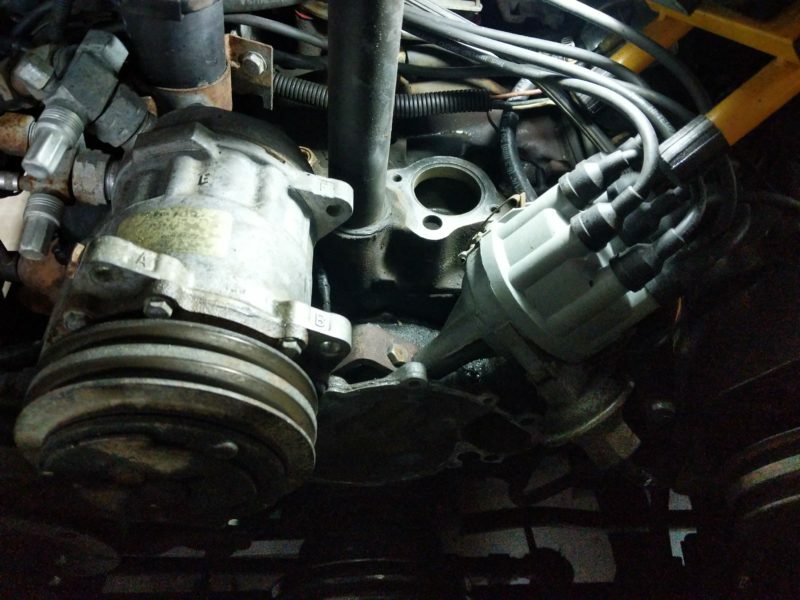 The alternator bracket and power steering bracket need to be loosened so the pump can full come off. Removing the pump was not actually that bad as the RTV did not have a good seal on the surface. Cleaning up the filler neck of the radiator. Crack is visible now. Before I tried brazing the filler neck of the radiator I first removed the fan shroud as It is made of plastic and I did not want to melt it. I cleaned up the filler neck area with a brass wire brush on the drill. Tools used to braze the filler neck on the radiator. 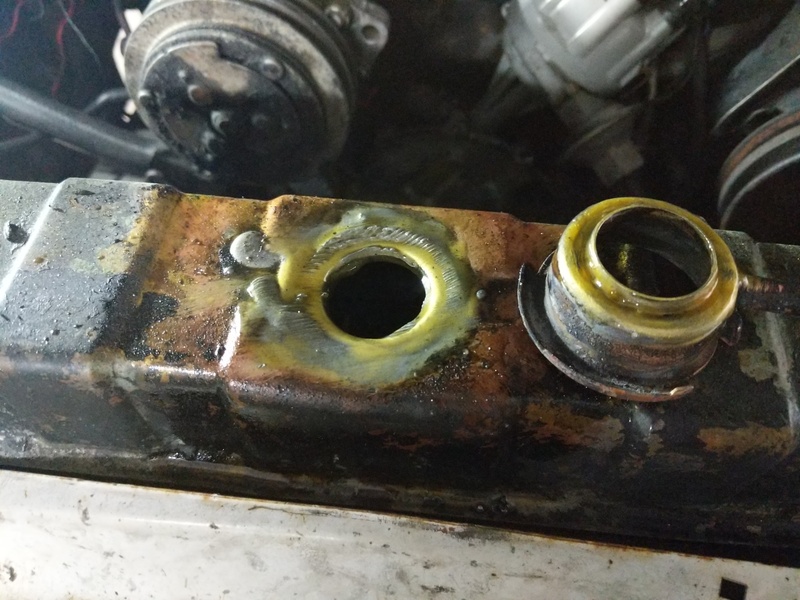 I coated the filler neck joint with lots of acid based flux and then heated it up with the propane torch till I could pop it off with some pliers. Removed filler neck for cleaning and rebrazing. After the filler neck came off I cleaned up the mating surfaces with the brass wire brush on the drill. Then I coated both surfaces with more flux and pressed the filler neck back into the radiator. Then heated up the joint again and brazed it with the solder. Close up showing the crack is gone. Cleaned up T-stat gasket surface. Since the T-stat housing area and water pump mounting surface was so corroded I hit the entire area with the brass wire brush on the drill. Cleaned them right up. 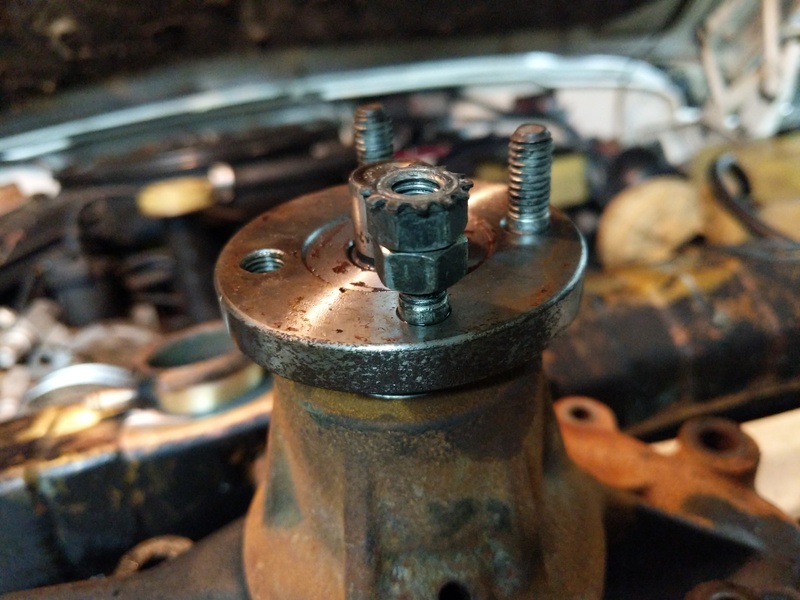 During the clean up I found that the previous owner just left this broken bolt for me to find. Woooooooo…. Looks like someone already tried to extract it as there is a hole drilled into it. I finished the job by drilling a 1/8″ pilot hole into it and then used a #7 drill bit to clean up the hole. I then put in a 1/4-20 tap to chase the threads. 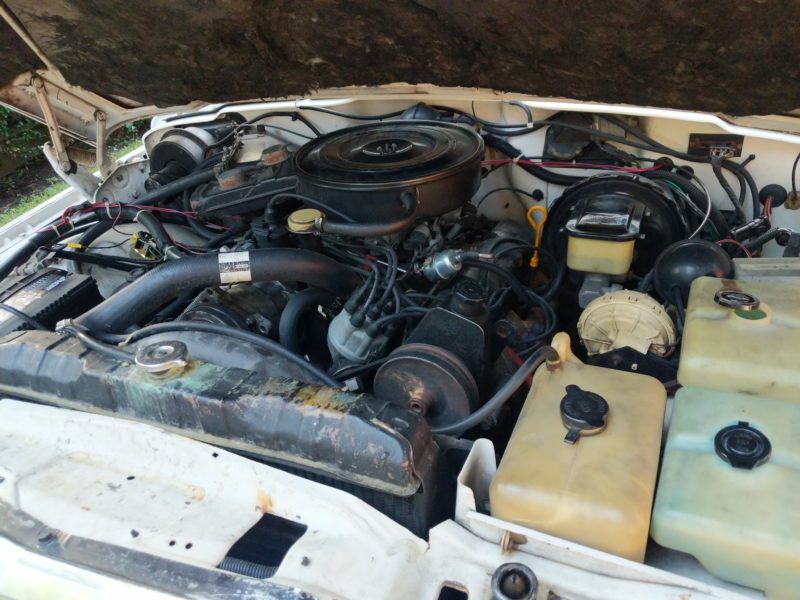 If I ever sell this engine to someone I would go back and drill it out and helicoil it but this fix will probably work for what I need. T-stat installed!T-stat installation was next. On my water related gaskets I like to use Permatex High Tack Gasket Sealant on both sides of the gasket. I know some say to never use a sealant or use only blue RTV but I have never had to go back and redo a gasket with this stuff. Unlike RTV the High Tack Gasket Sealant is easy to clean up if you need to replace the part again in the future. If also sticks to the housings better which is great when you do not have mounting/alignment dowels. After the T-stat housing I installed the water pump and put the bolts back in the same way they came out. 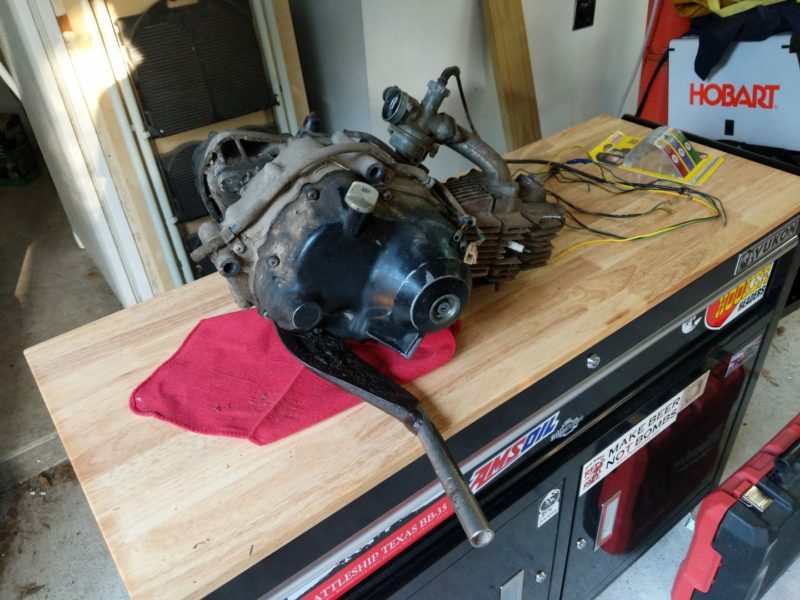 I looked up the torque numbers in the Factory Service Manual and torqued the T-stat housing and water pump to spec. 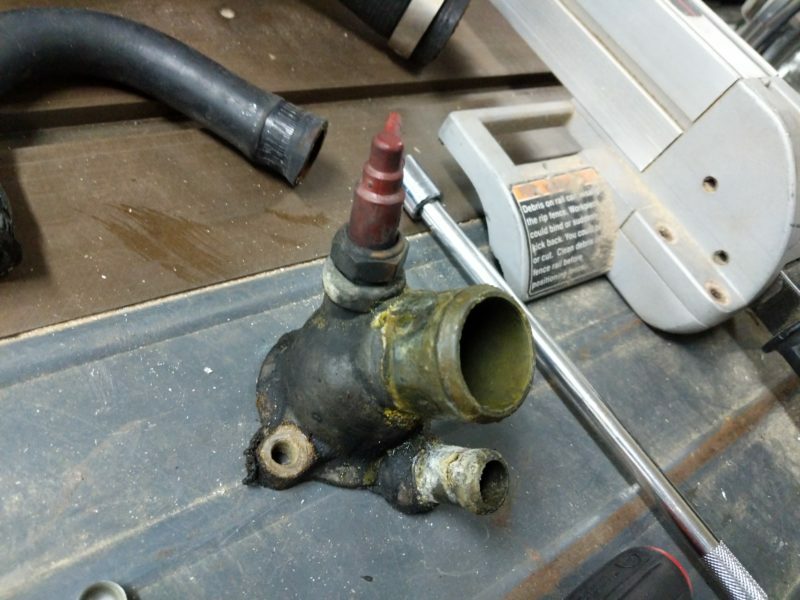 Removing the studs from old water pump. 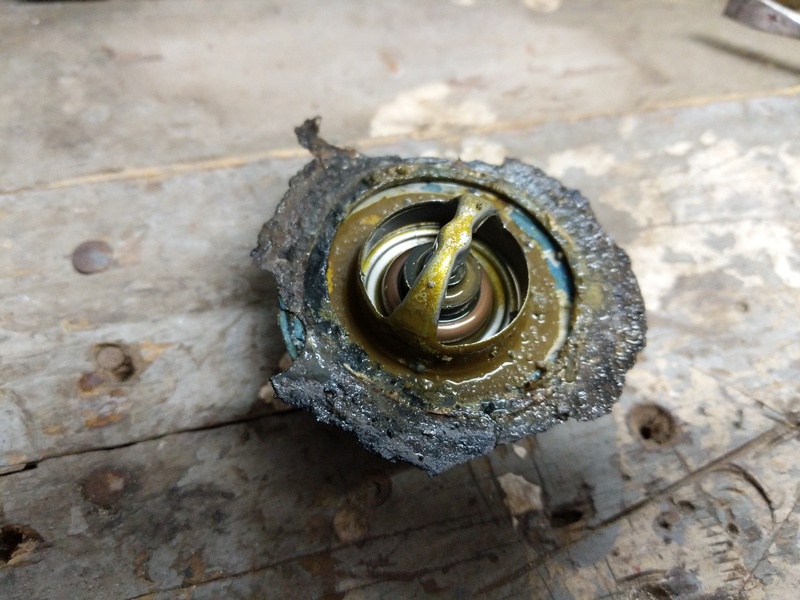 I then removed the studs from the old water pump using the stacked nut method. These studs need to be reused on the new pump. 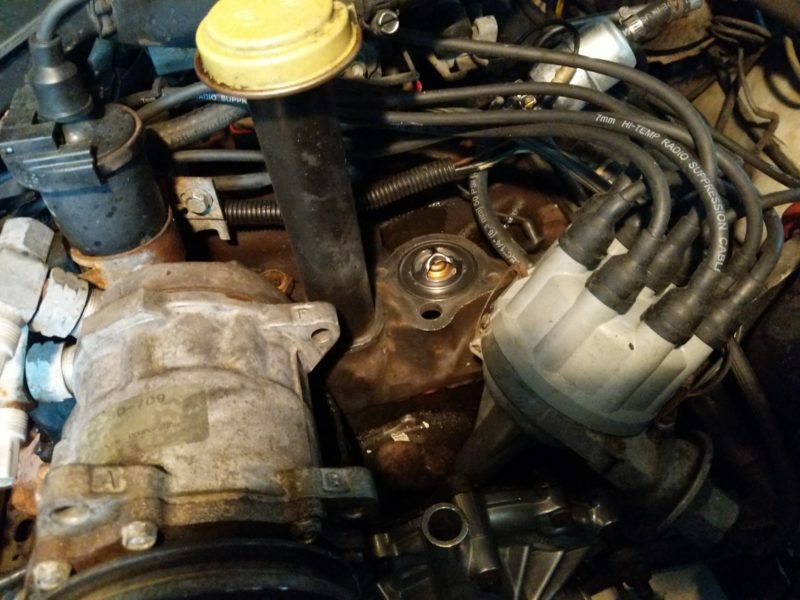 Then I put the studs on the water pump. 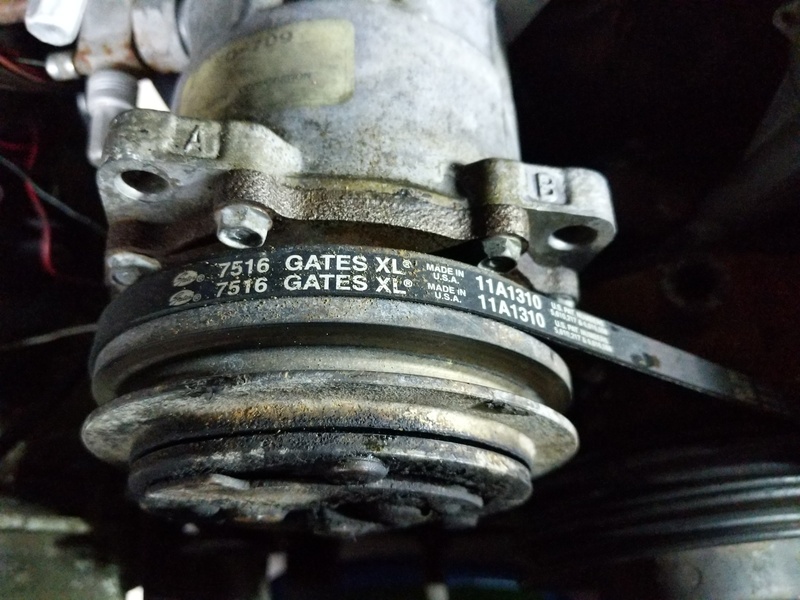 Then I put the water pump pulley on and reinstalled the belts but kept them loose till the end as I wanted to make sure I did not have to remove them later. 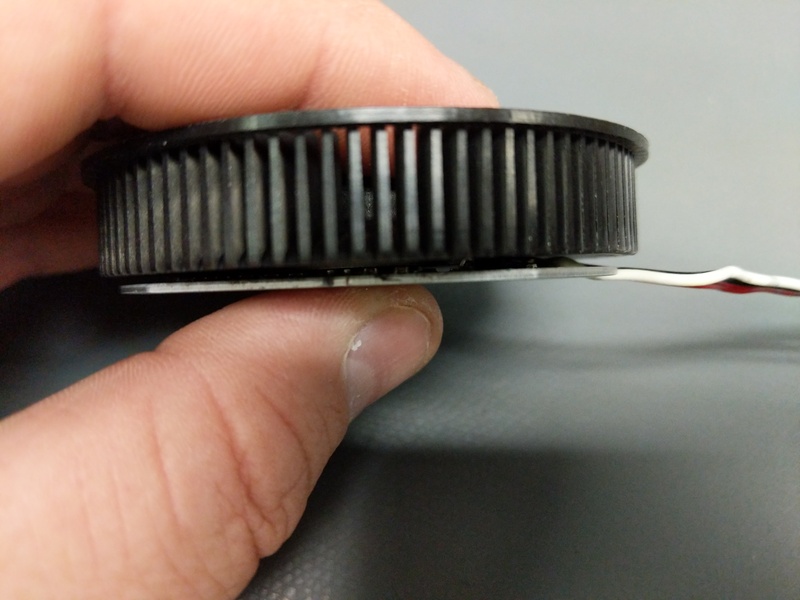 Using the belts to get friction while tightening the fan clutch stud nuts. I then installed the fan clutch/fan assembly. To prevent the pulley from rotating as I was tightening them I used one hand to press down the belts which prevent it from rotating. Installing the fan shroud was the last part of finishing up the front of the engine for this project. Removing the heater box. Two bolts and the blend door cable need to be removed from the engine side. 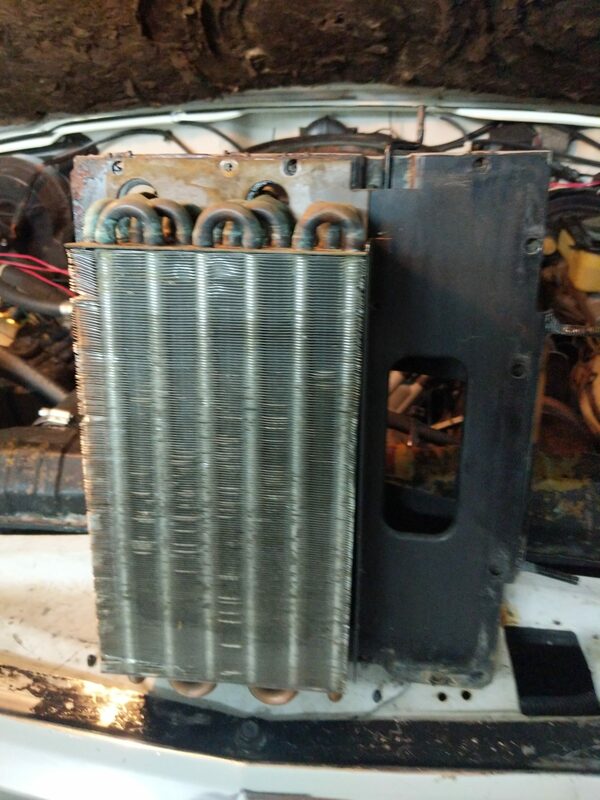 Now I wanted to clean out the heater core box since I had the coolant out of the heater core. 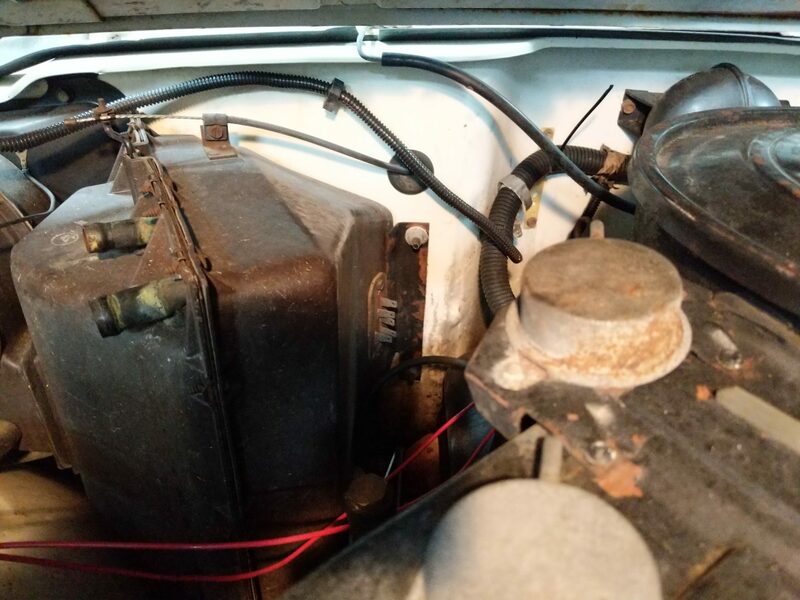 First I started by removing the two external bolts and the blend door cable on the top of the heater box. Dropping the A/C module under the dash. 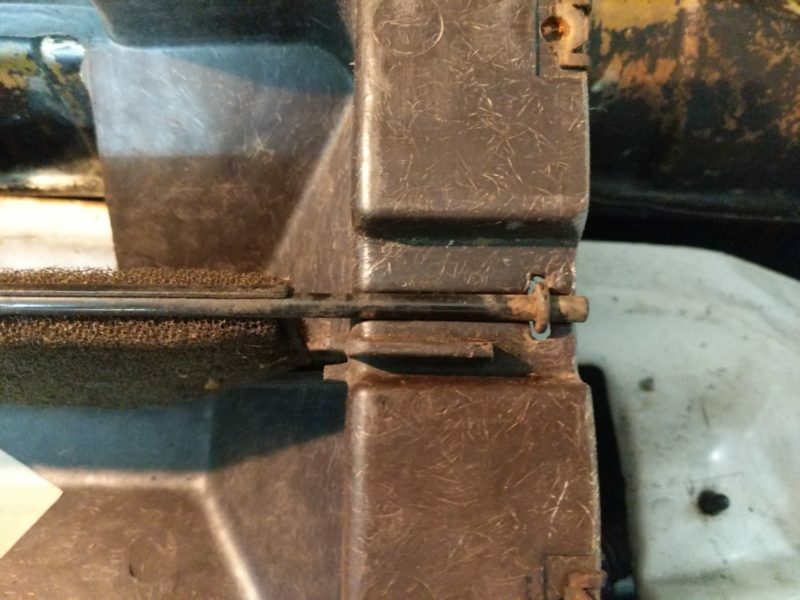 On the inside there are two more bolts that hold on the heater box. To get to these bolts the A/C module needs to be dropped from the dash. The A/C does not need to be discharged for this. There are around 6-8 bolts that hold it up under the dash. After removing the box kinda just falls down. 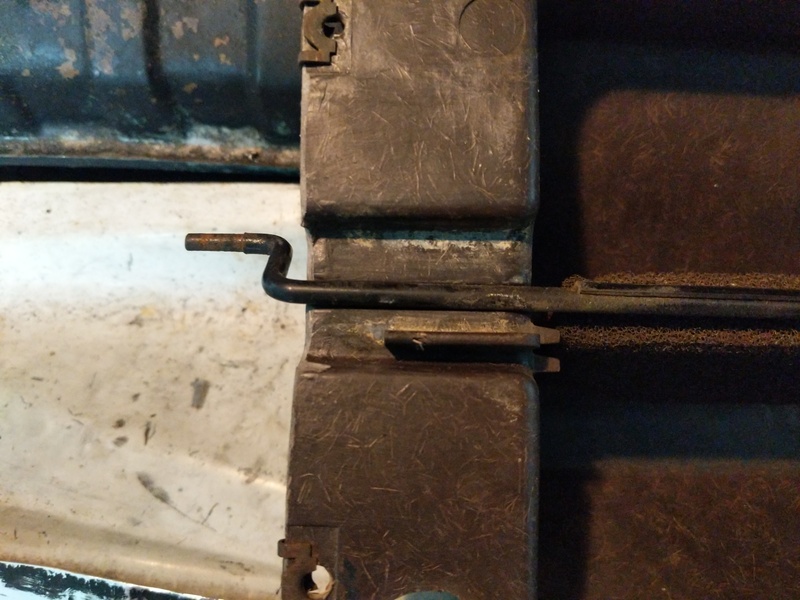 Wobble extensions to remove the behind dash bolts. Where to snake the socket. 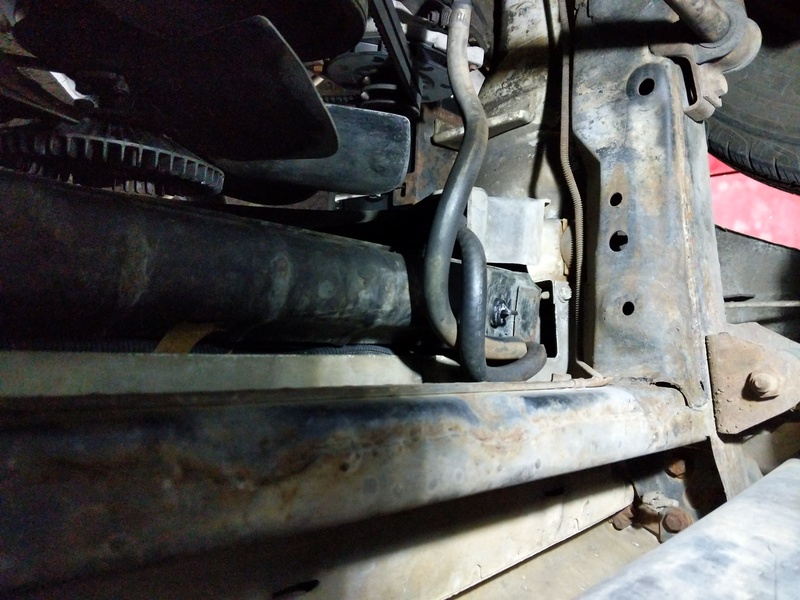 The easiest way I found to do this is to use lots of wobble extensions on a deep socket and snake this contraption in between the A/C module and the dash. Makes it fairly painless. 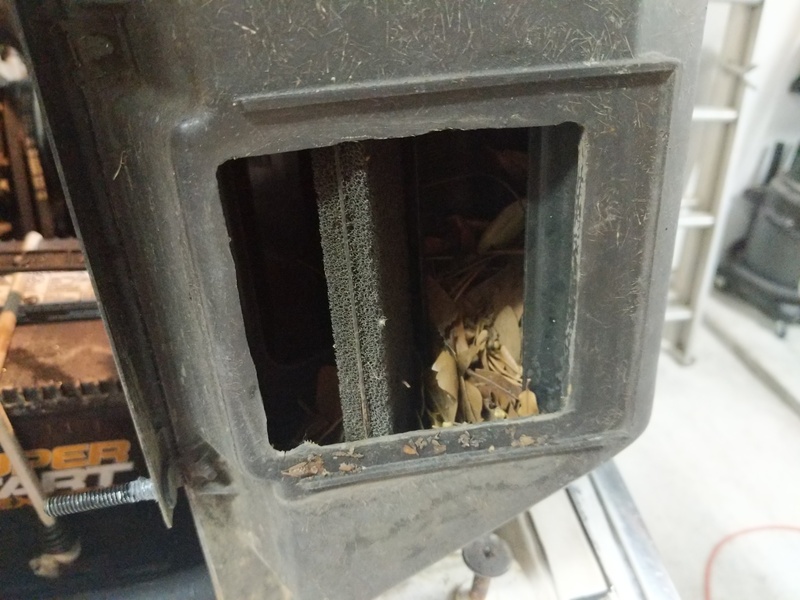 Lots of leaves built up in the heater box. 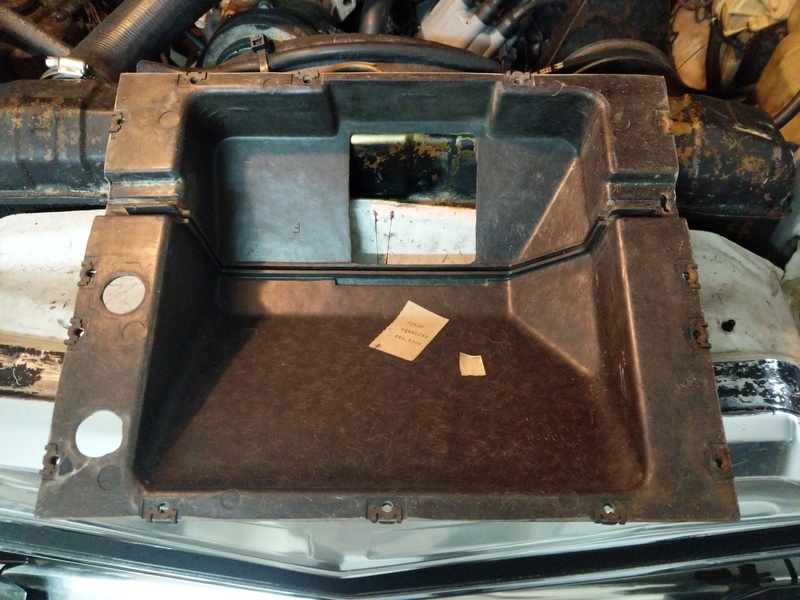 Then pull the heater box from the engine compartment. Mine had quite a bit of leaves that prevented the blend door from moving all the way. 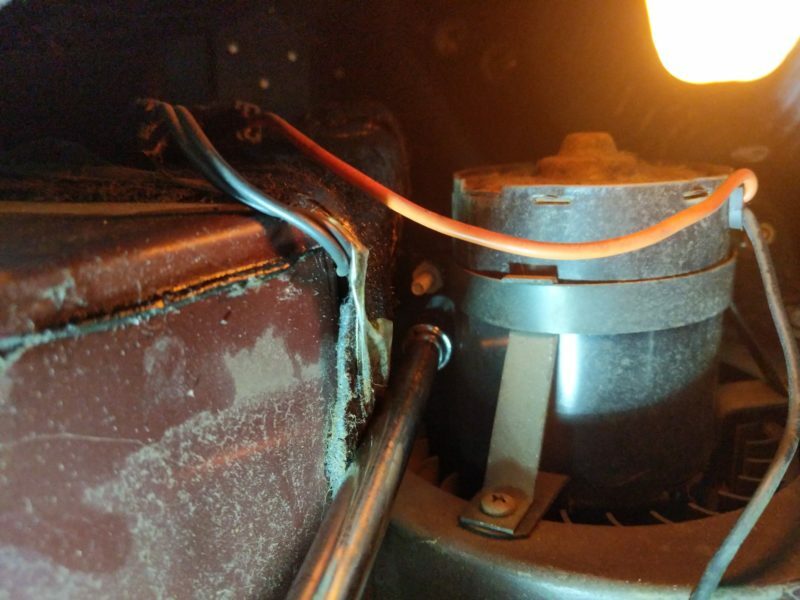 The heater box opens up by removing all the bolts on the outside. 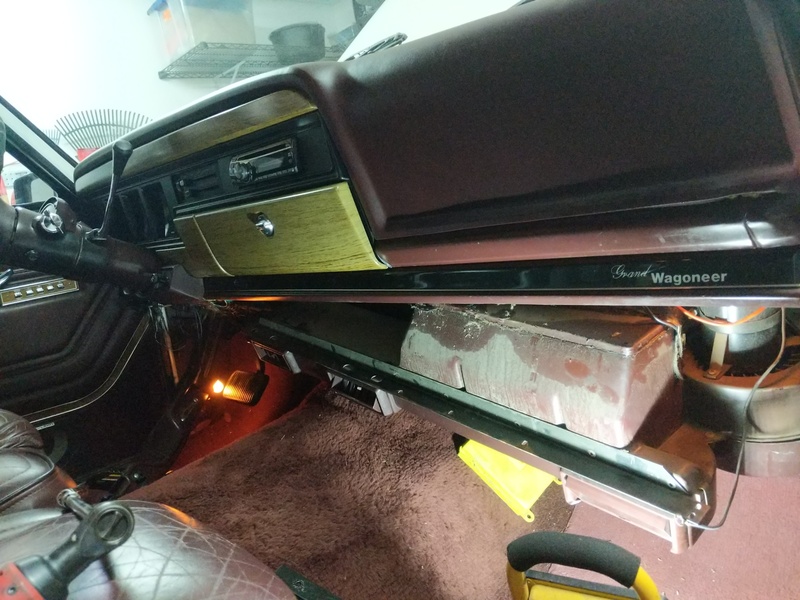 There are five pieces; two external fiberglass shells, inner metal plate, blend door, and the heater core. I took my heater box all apart and cleaned it up. Then I reassembled it. External shell ready for reassembly. Reassembly of the bottom of the blend door. Reassembly of the top of the blend door. Heater core installed. View 1. Heater core installed. View 2. Heater core installed. View 3. First put the blend door back into the shell, next put the metal inner plate in. Next install the heater core and then the top of the shell. 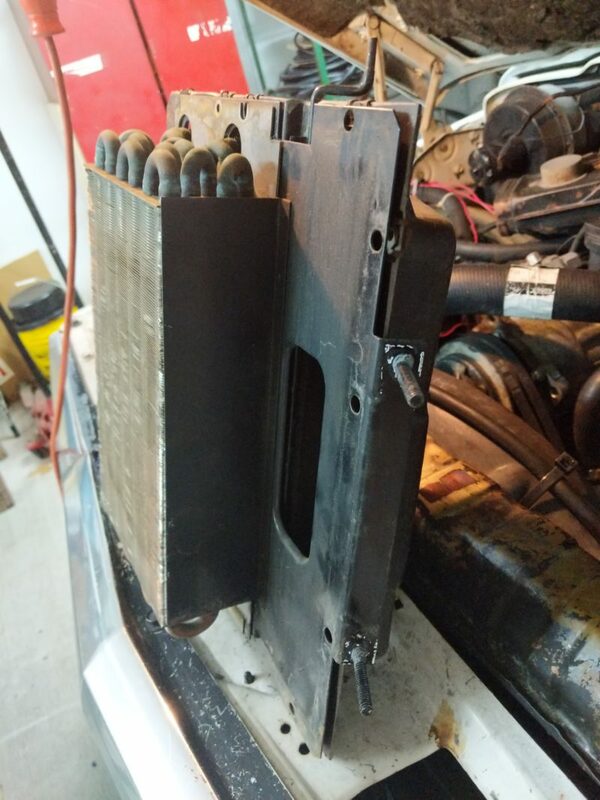 When putting the bolts back in do not tighten them up all the way till all the bolts and the heater core tabs at the top and bottom are all lined up. Reinstalled heater box blend door cable. 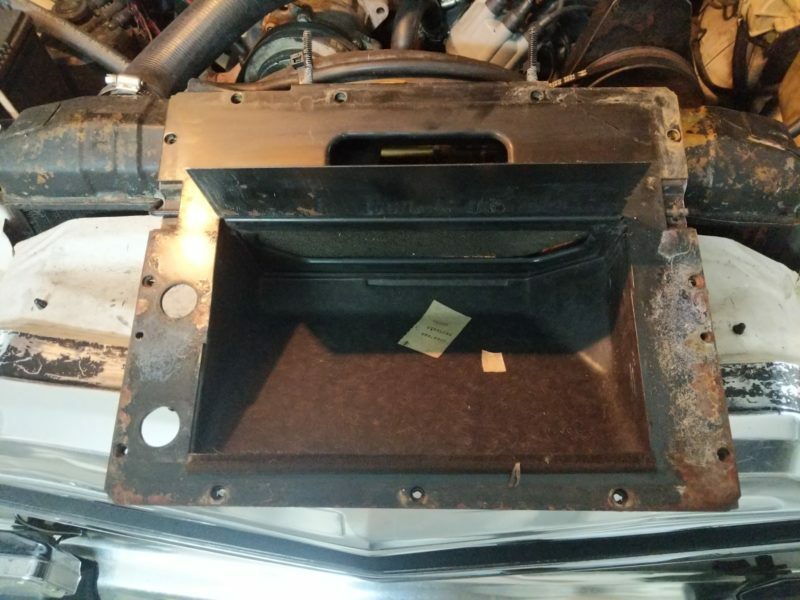 With the box cleaned up I reinstalled the heater box and put the dash back together. 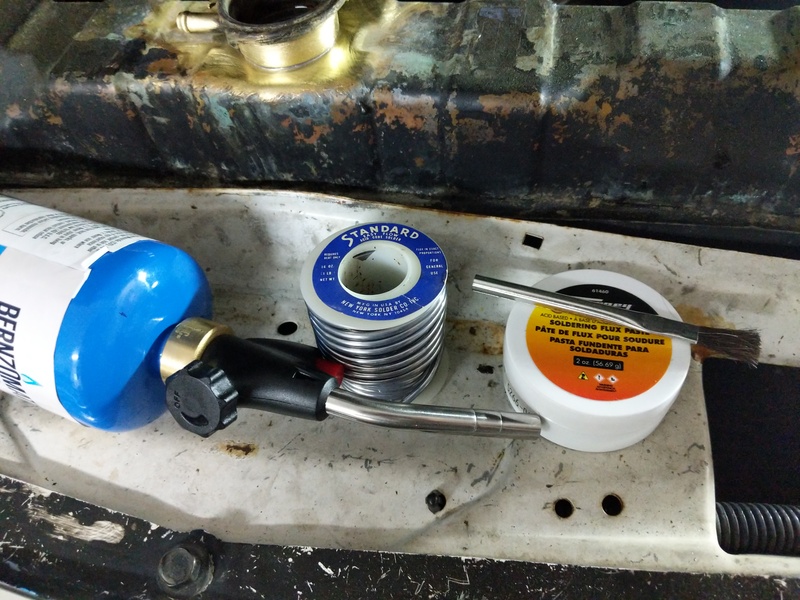 Then reattached the blend door cable.I hooked all the hoses back up on the radiator and heater core and refilled the engine with new coolant and put a new radiator cap on. New radiator cap and the brazing seems to be holding pressure! 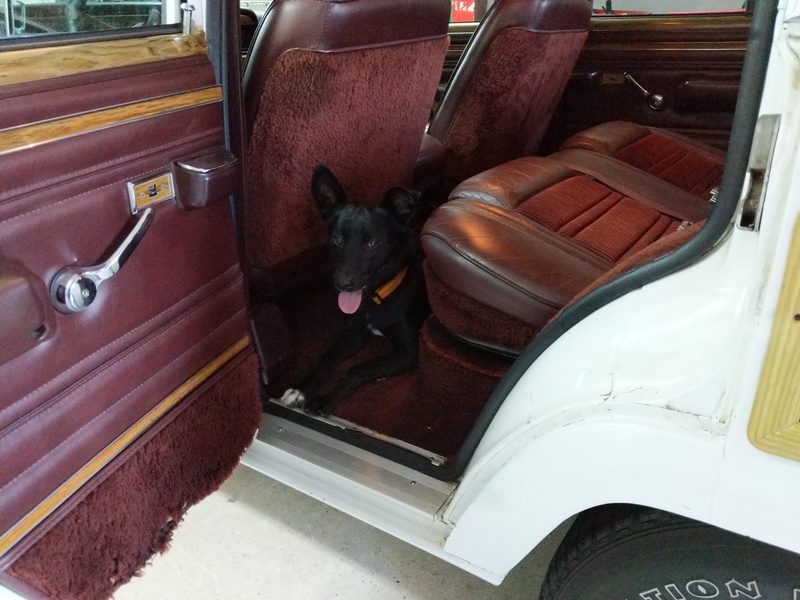 A trip around the block and to the grocery store shows that the Wagoneer has stopped puking radiator fluid! Success so far! 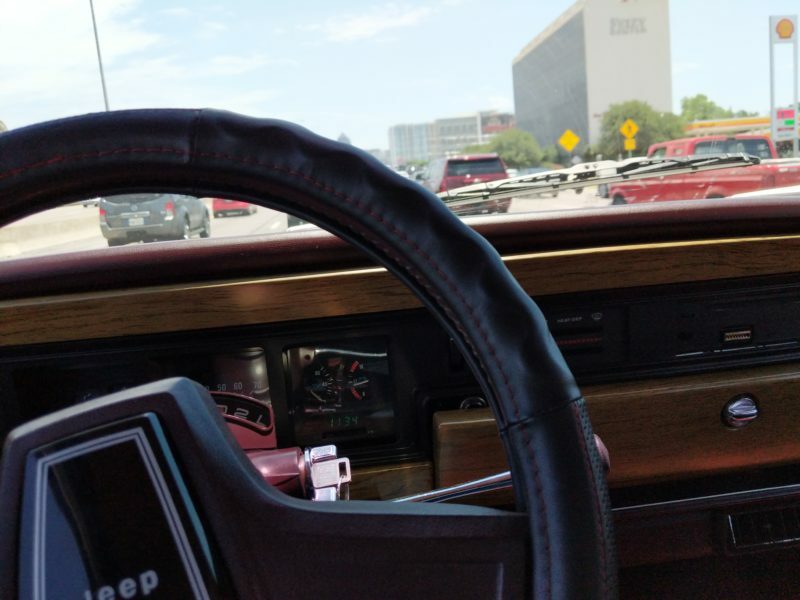 Climate controlled seats in your car are probably one of the greatest inventions since sliced bread if you live down in humid hot climates (like Houston!). Since trying them out in my Dad’s Tahoe years ago I have always wanted them in my Jeep but no one really makes after market seats that have them and there are no “kits” like adding heating elements to seats. 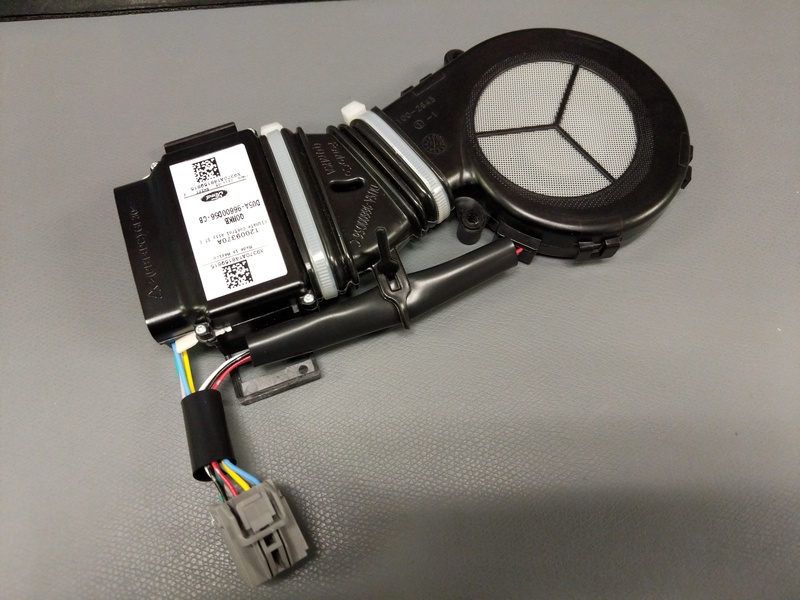 2015 Ford F-150 seat climate control module. 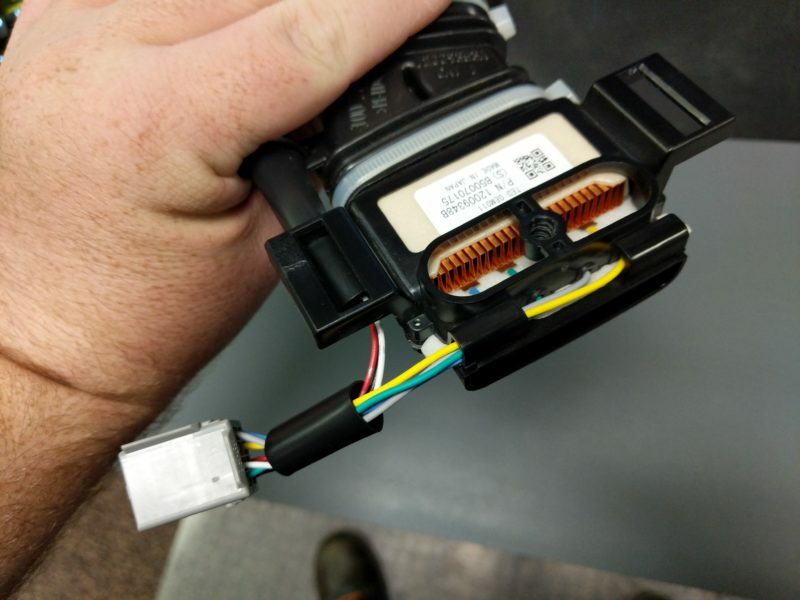 I managed to snag a 2015 Ford F-150 seat climate control module unit on ebay for $40. 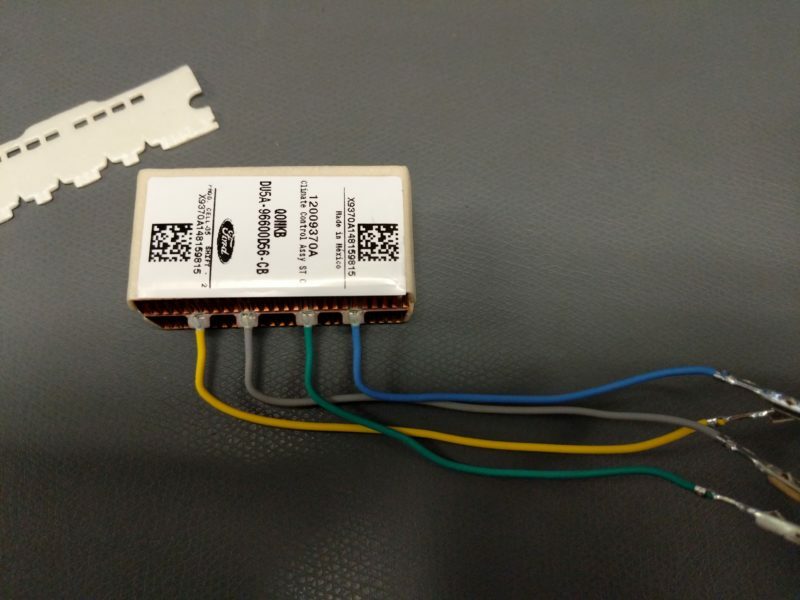 I picked this unit cause it looked compact and looking at the wiring from pictures I found on the internet it looked like I could reasonably make this work. 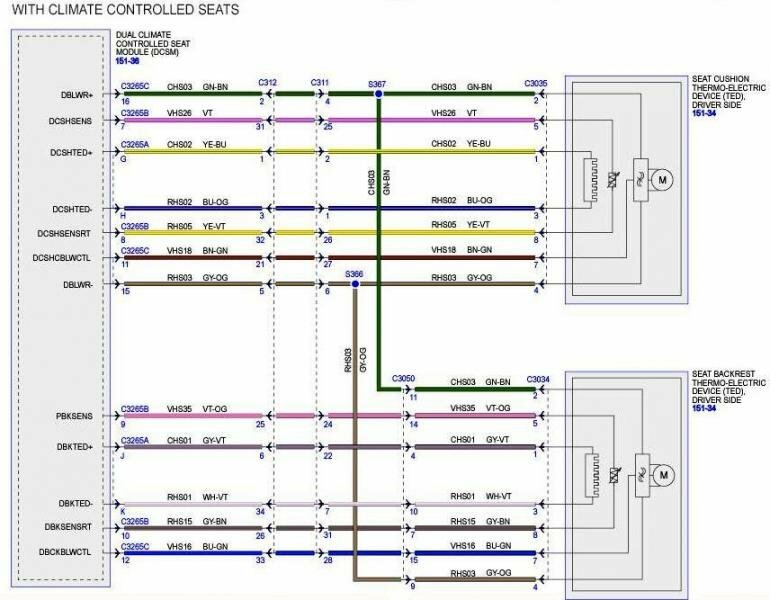 Ford wiring diagram for climate controlled seats. Looks simple enough! So how these work is via the peltier effect. The peltier unit has two copper heatsinks attached, one for each side. When voltage is applied to the peltier unit one side gets hot and the other cold. This is transferred to the copper heatsinks where the fan blows creating a stream of lava hot air and arctic frost air. Exhaust port of the unit. This is typically vented back into the cabin under the seat or goes into the climate control system of the vehicle. This port goes into the tubing that goes into the seat cushion. 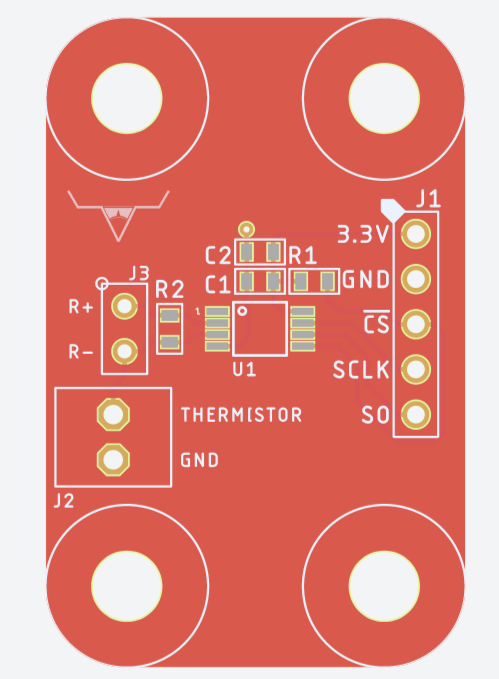 Depending on the polarity of the peltier it can be hot or cold. This is the peltier unit removed from the housing. 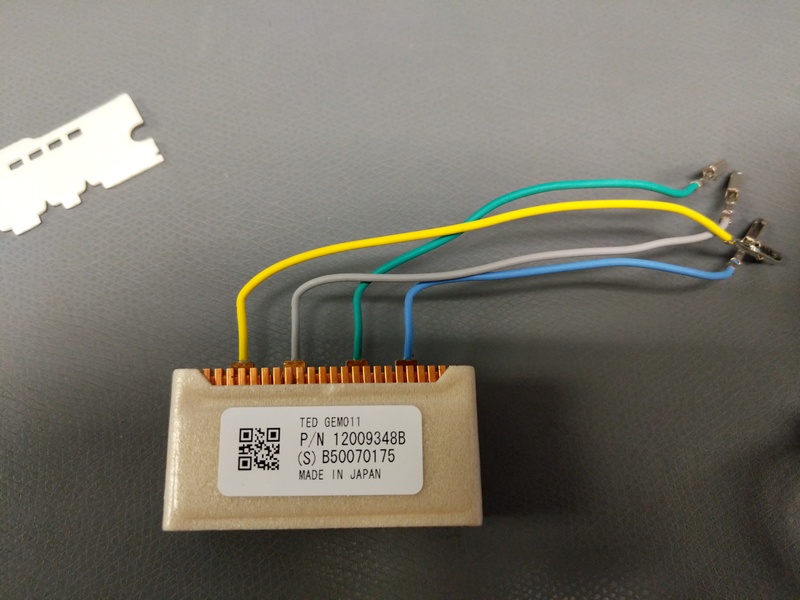 The blue and yellow wires ended up being the peltier unit and after some testing the green and gray wires seem to be a NTC 200K thermistor. With 12V on the peltier in heating mode the resistance is 54K ohms. With 12V on the peltier in cooling mode it is 240K ohms. 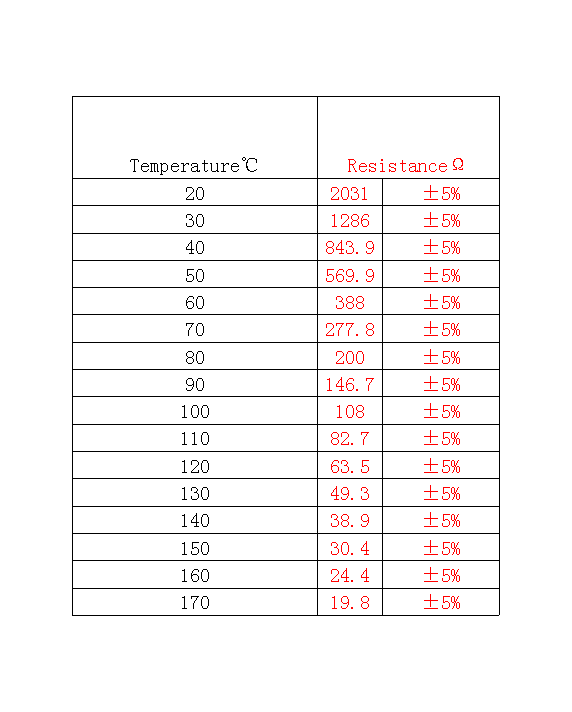 Room temperature resistance is around 170K ohms. The fan is interesting. There are three wires. Red, black, and white. I figured red is power (12V), black is ground, and white is a pulse that I can measure and find the RPM for feedback control similar to the thermistor on the peltier. Fan part of the Ford module. 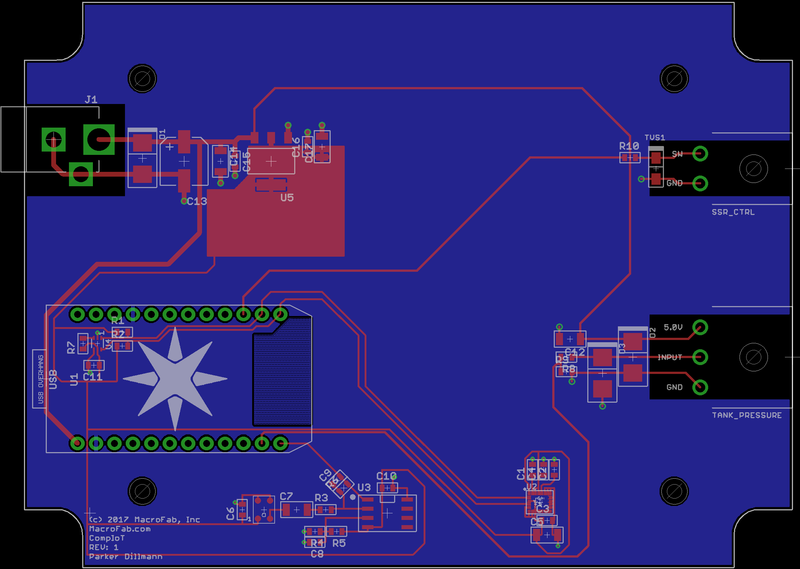 Wired up the fan with 12V on red and ground on black. No go. Attached the white wire to 12V and it spun up! Pulling 1.4 Amps. Cool. Then the red wire fell off the wire clip and it was still spinning. 12V on the white wire (still at 1.4A!) and nothing on the red…. Weird.. Why is that? 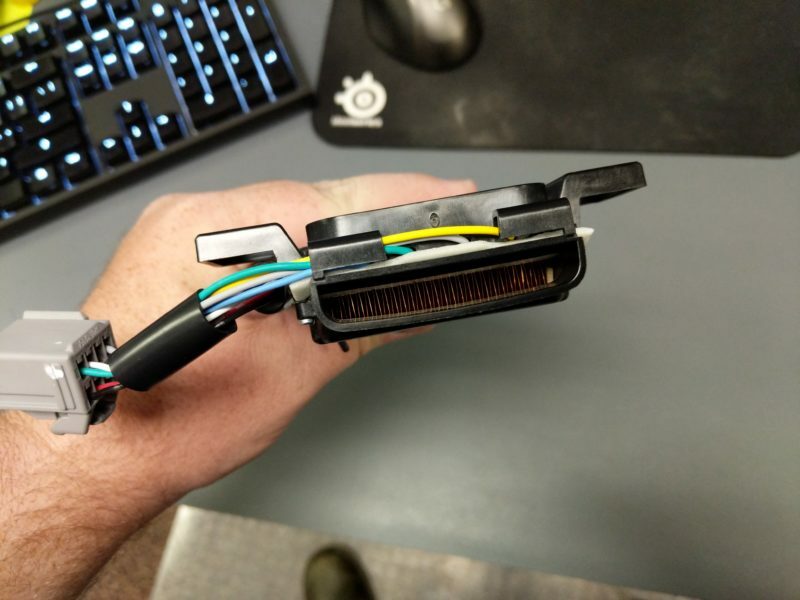 Maybe the red wire was feedback? Looking at the signal on the scope proved that was not the case. Time to open it up! Interesting construction of the fan. 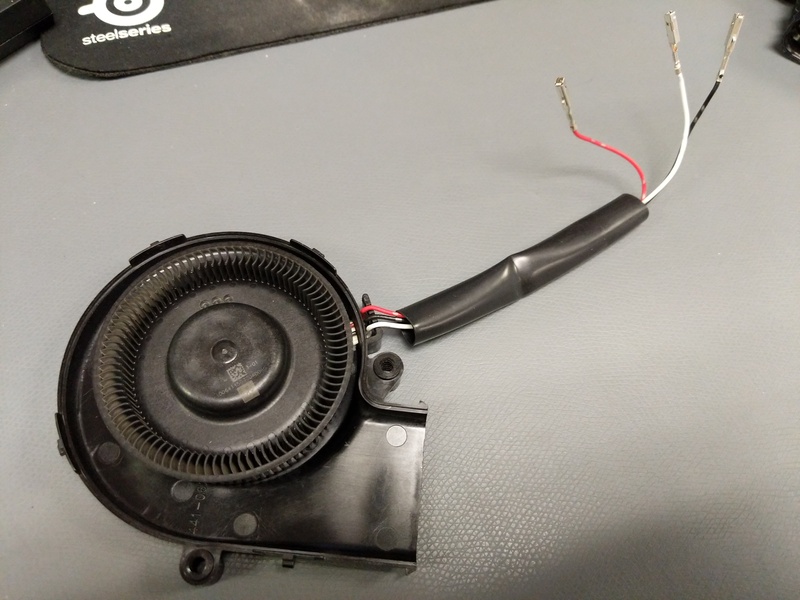 I took the fan out of the plastic housing. Looks like the PCB is directly on the aluminum or steel backing plate? 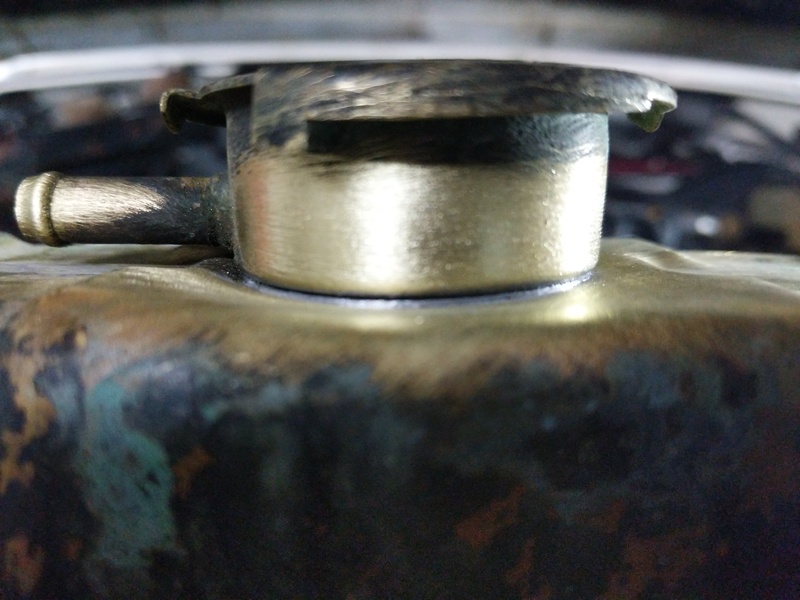 The blades/cage of the fan is attached with a blind c clip in a bronze bushing on the back of the fan. This was pretty difficult to remove but a sharp pick and screwdriver I managed to remove it. The PCB exposed. TELL ME YOUR SECRETS! Yup! The PCB is on an aluminum or steel substrate (need to check which one) instead of the typical FR4 base. All single sided routed. 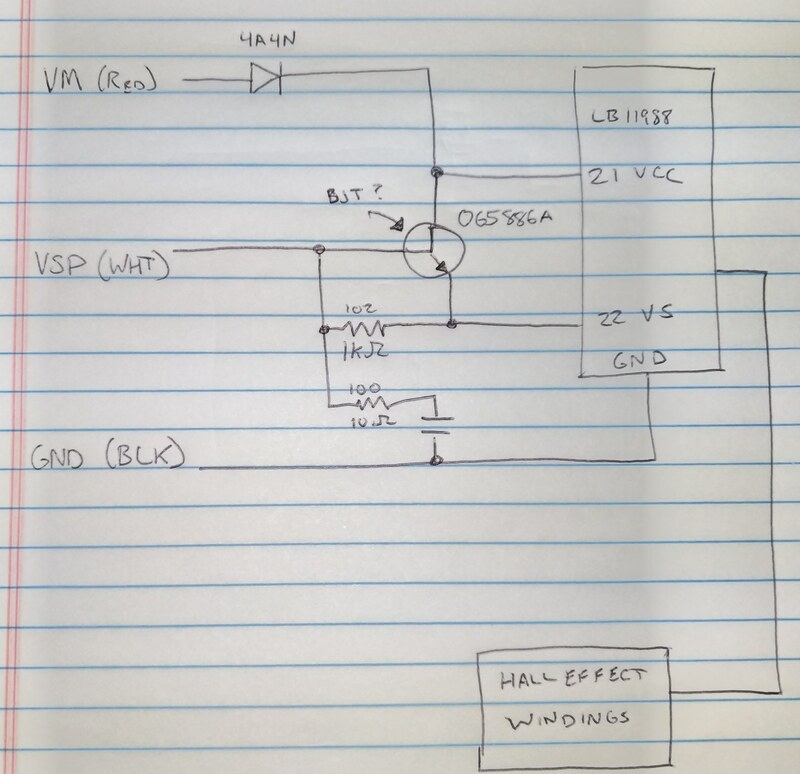 Red wire is labeled VM, Black is GND, and the White wire is VSP. I manged to get a part number from the large IC labeled IC1 on the upper right. 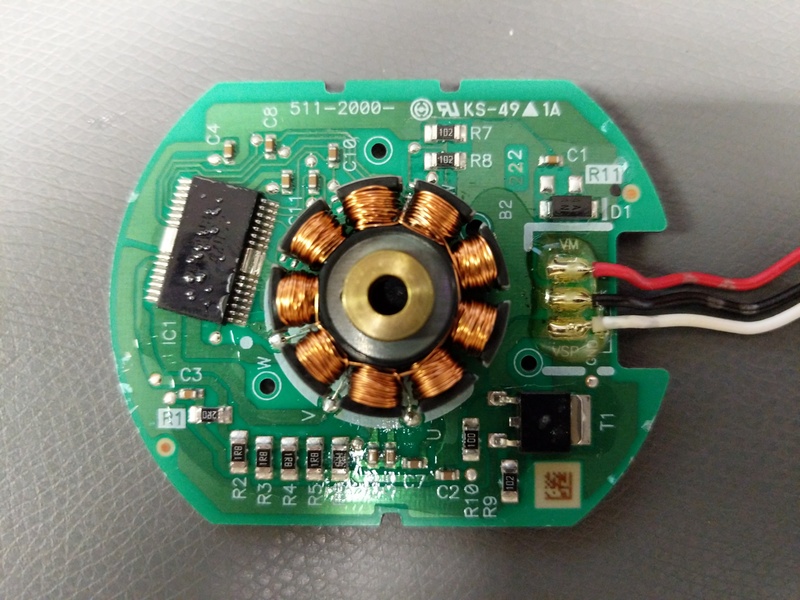 The LB11988 is a brushless motor controller from On Semiconductor. T1 is labeled 065886A and is a DPAK package. I dunno what this part is at this point. 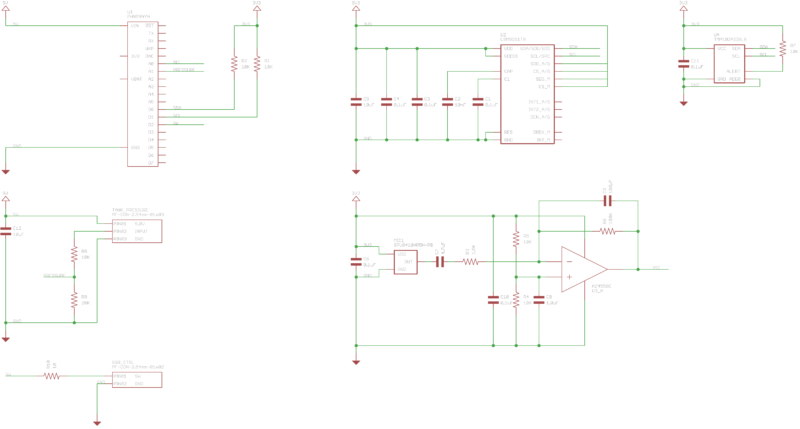 Looking at DPAK mosfet parts the pinout makes sense. It also could be a large BJT. 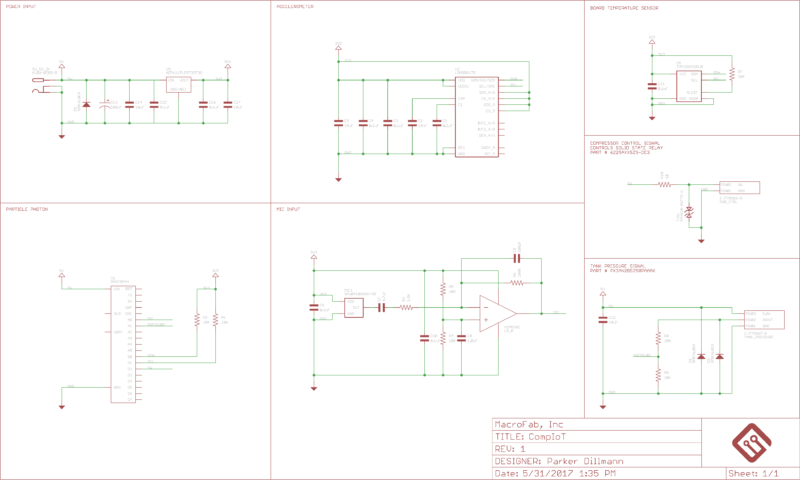 I then drew up a schematic. 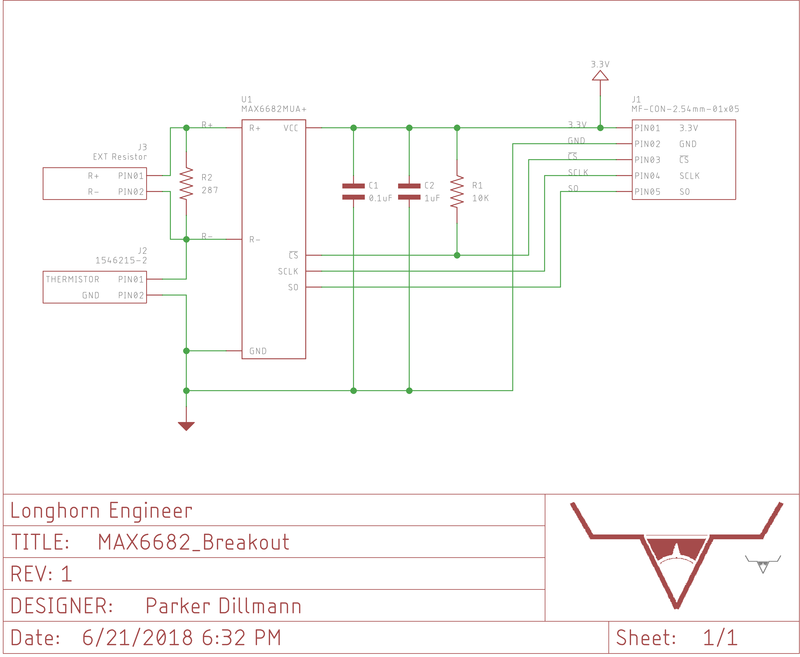 Fan power front end schematic. The VCC pin on the LB11988 powered the internal control circuitry for the IC and VS is the motor power from I can gather. The datasheet is a bit vague here. If the Red wire is disconnected the White wire provides all the power to the motor. That means that the T1 part either has a blown gate if its a mosfet (mosfets are not supposed to pull significant or any power through the fate) or T1 is a BJT with crazy base junction current. I removed the T1 part and tested so see if it was a BJT and sure enough I was able to measure the diode effect from base to collector and base to emitter. Looking at DPAK BJTs that are automotive grade shows that some of them can have up to 2A of base current….Checks out I suppose! 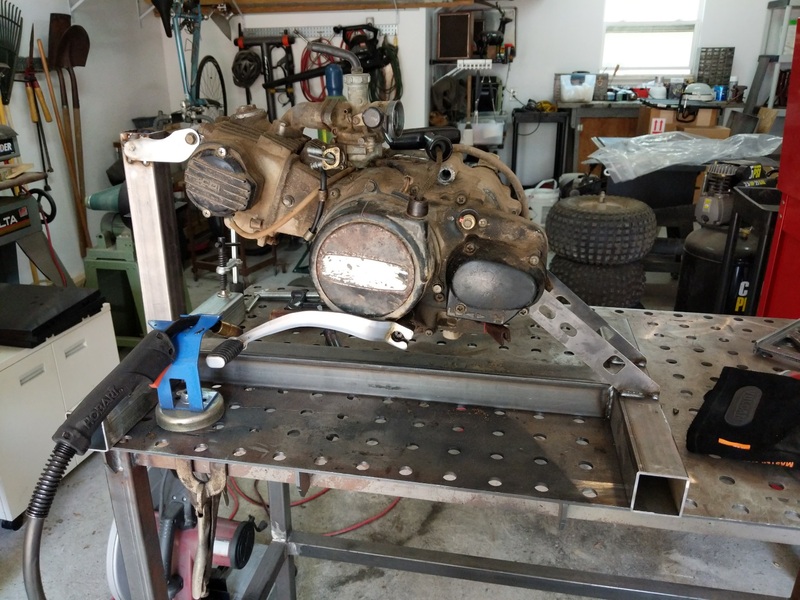 I was able to get the engine stand completed and engine running again. 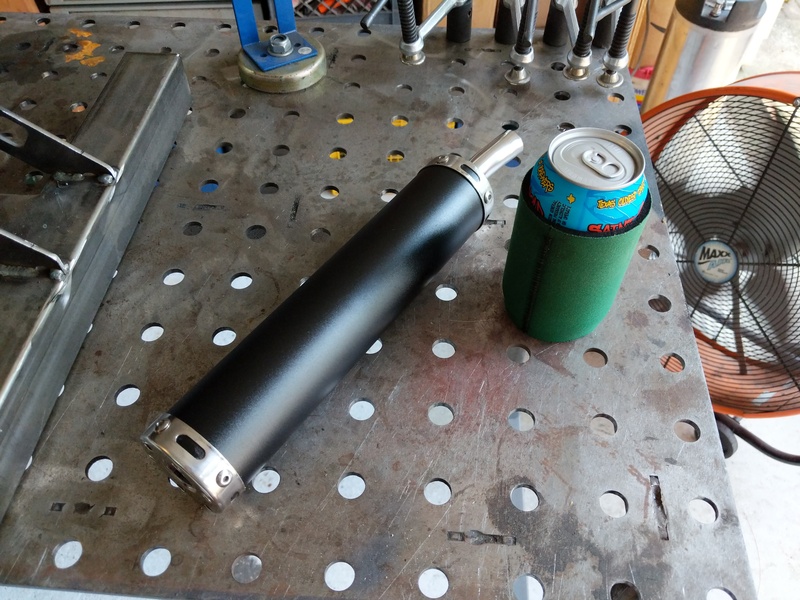 Cheapo moped muffler and beer! The old exhaust system was pretty much cracked and fell apart when I tried to remove it from the three wheeler so I had to make a “new” setup. I bought the cheapest muffler I could find on eBay ($15 moped muffler) and some spare steel tubing I had and I welded up a temporary exhaust. 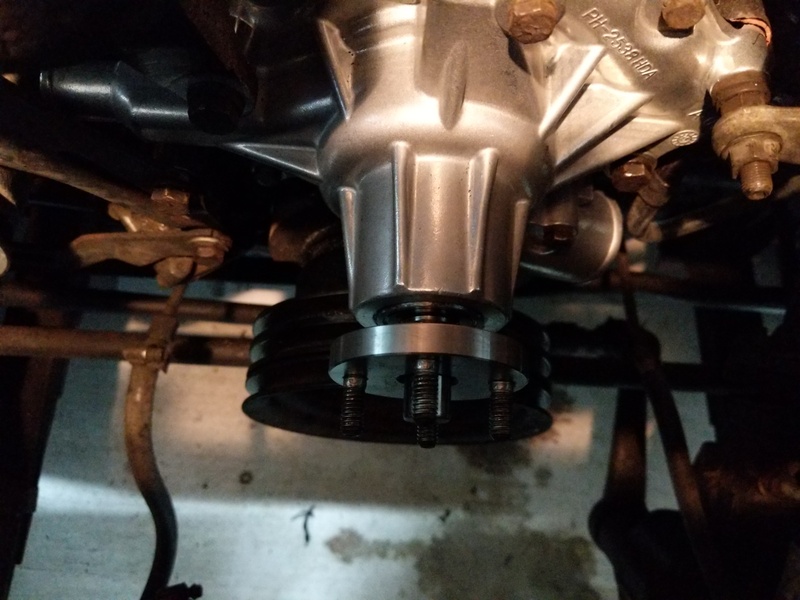 I reused the old exhaust flange that mounts to the engine but I would like to replace all of it with new material when I finally transplant this engine in the go cart. Straight exhaust setup reusing the original header flange and some spare tubing. Ugly but it works. 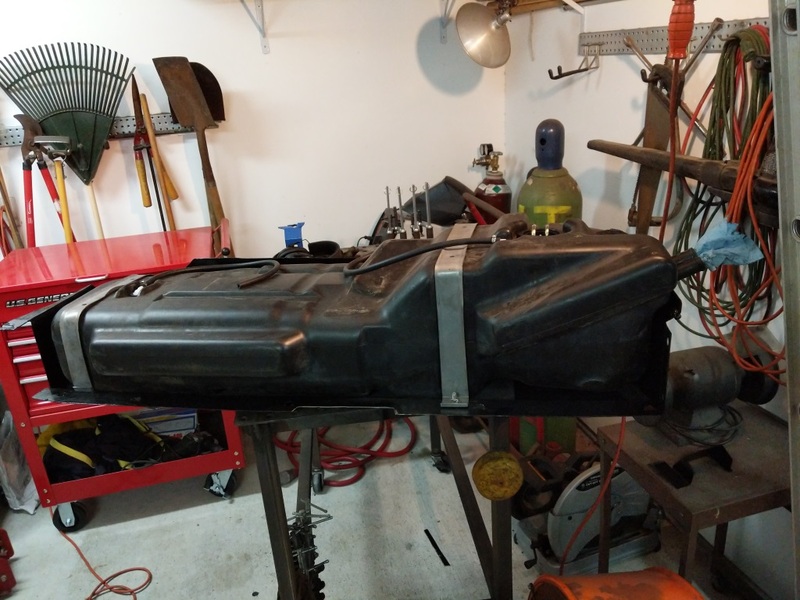 I then mounted the fuel tank I bought on ebay for $6. Fairly tiny with only 1L of capacity but the tank was pretty cheap and doesn’t leak… can’t complain about that. 1L fuel tank, hoses, and fuel filter from ebay. Fuel tank mounted on the engine stand. The fuel tank mount is designed to be unscrewed giving me more access to the engine when I start disassembly. And it fired right up after filling the tank up. Glad I got the wiring right! 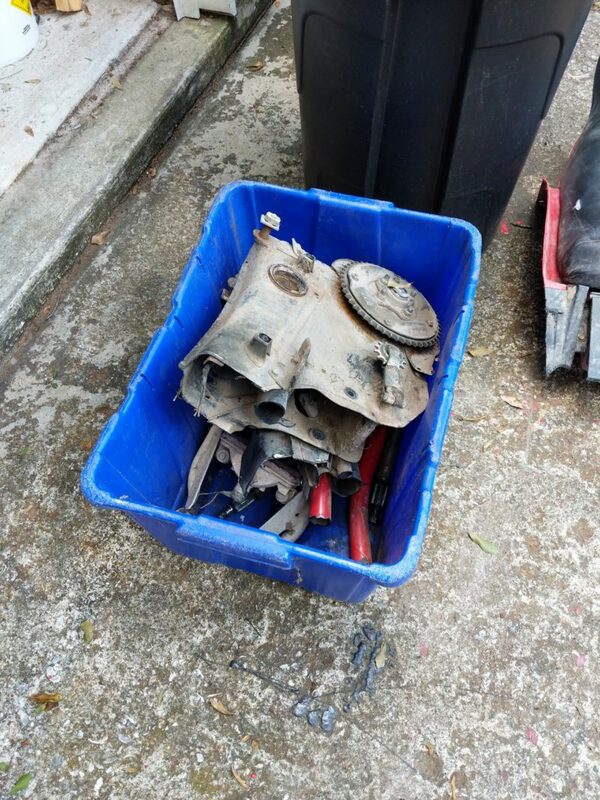 What is next is to disassembly and clean the entire engine. Once it heats up it smokes pretty good so I will need to at the minimal replace the piston rings and lap the valves. Probably end up honing the cylinder walls for the new rings. 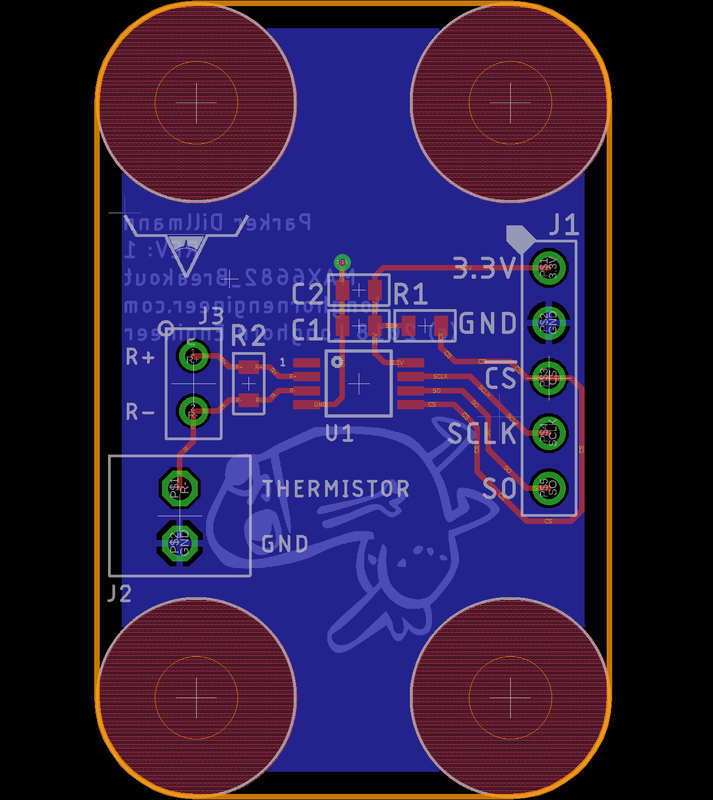 Here is the cleaned up schematic for the compressor iot PCB. 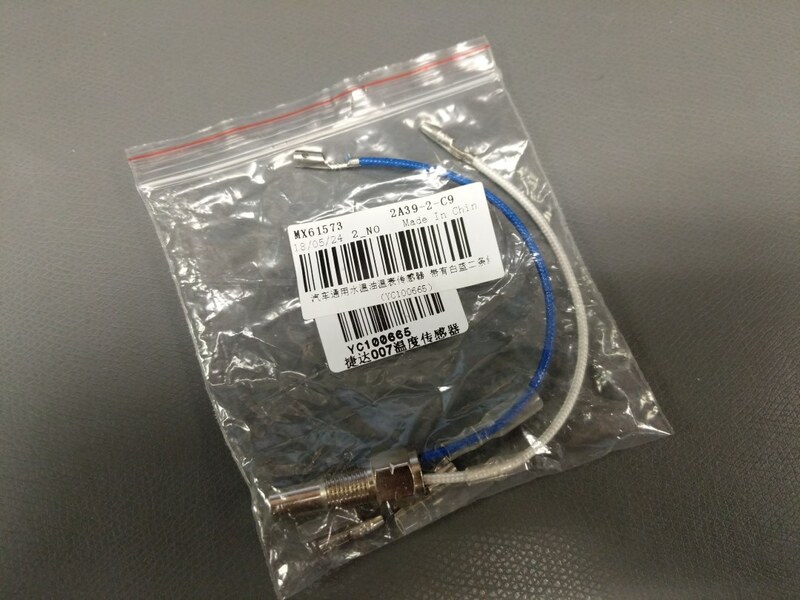 I decided to go with the ICD15S13E4GX00LF VGA connector. Was slightly less expensive and had a better mechanical drawing to convert to a footprint. Those that listen to my podcast know that I enjoy working turning wrenches on vehicles and engines. Before my friend Stephen moved to Colorado he dropped off his old Honda ATC110 3 wheeler. It was in pretty bad shape. The drive train was all twisted up from when the chain fell off and jammed up. Fenders where cracked and the front fork was tweaked a bit. Only good thing was the 110cc engine fired up right away. This gave me an idea. 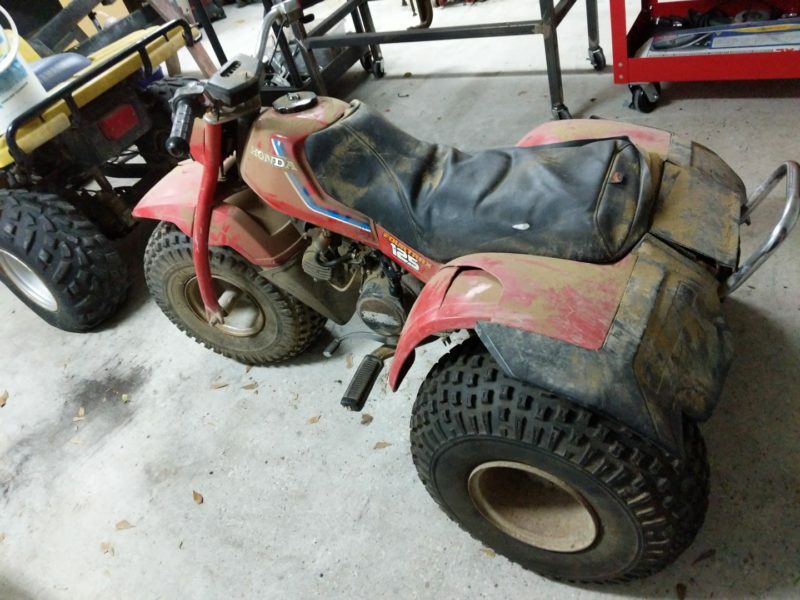 When I was younger I always wanted to build a go cart but never had the funds, tools, and my parents where very wary of the idea. Now I have a perfectly good 110cc engine, a welder, and no longer under the supervision of my parents :) . 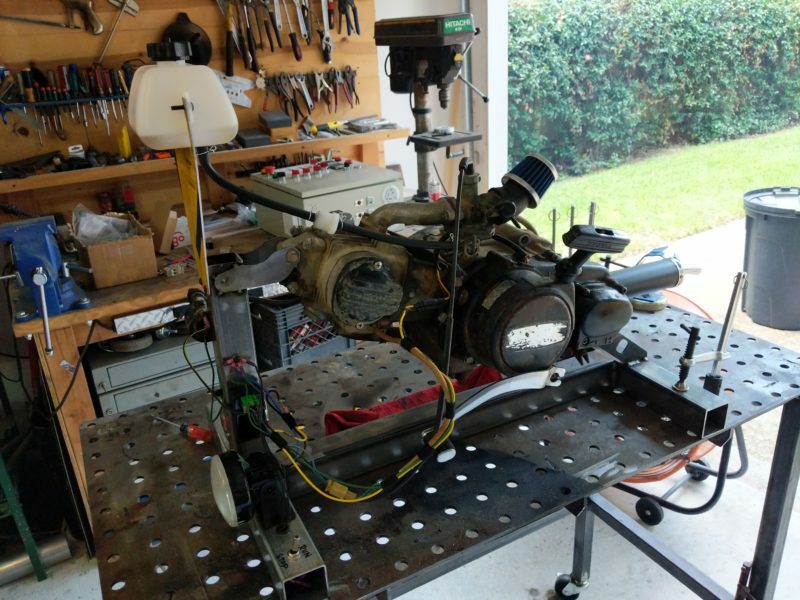 Honda 110cc engine yanked out of the 3 wheeler. After a couple 11mm and 14mm bolts the engine was freed from the old 3 wheeler chassis. Time to get rid of the old chassis and parts I am not going to use. I looked online and these chassis’ don’t really sell and would be a pain to get rid of otherwise. 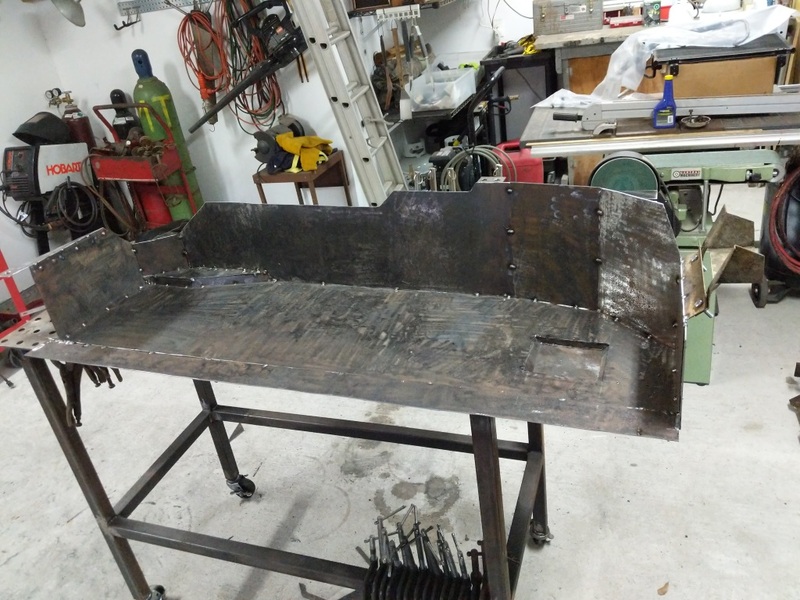 A sawzall and cut off wheels made quick work of the pressed steel chassis and tubes. 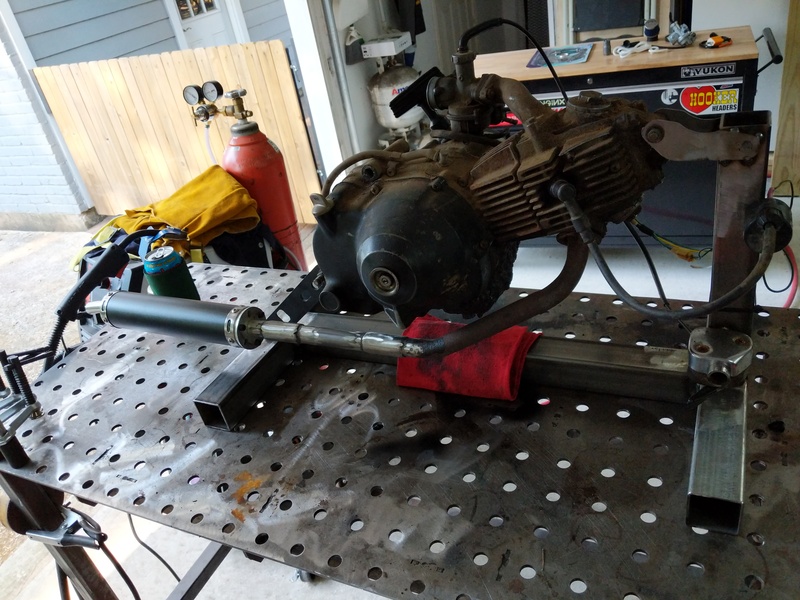 With some scrap material I had left over from other projects, I fabricated an engine stand for the 110cc engine. 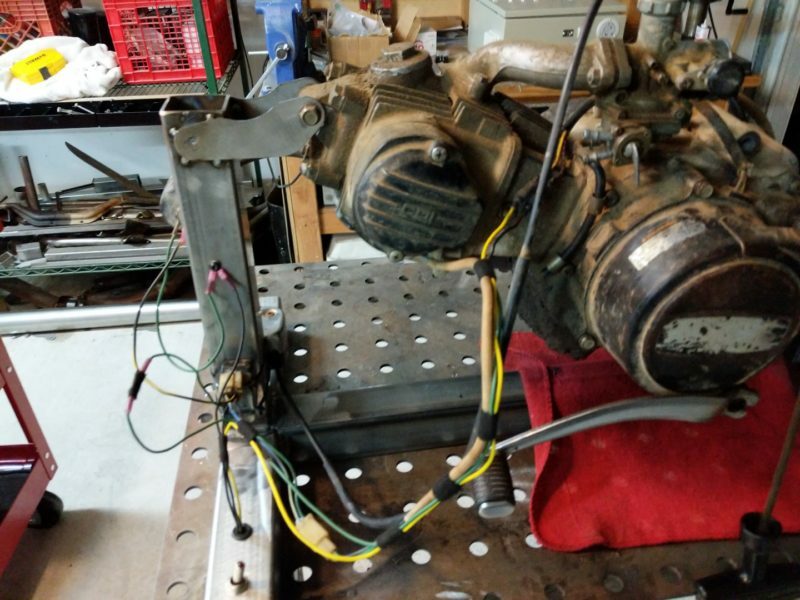 I then wired up the various electrical bits of the engine. These engines have very little electronics to drive them. An alternator generates the power for the sparkplug which is controlled by the CDI (Capacitor Discharge Ignition unit). I found the wiring diagram for this engine here. On the other side of the engine stand I mounted the throttle and ignition coil. What is left on the engine stand to build is an exhaust system and adding a fuel tank. 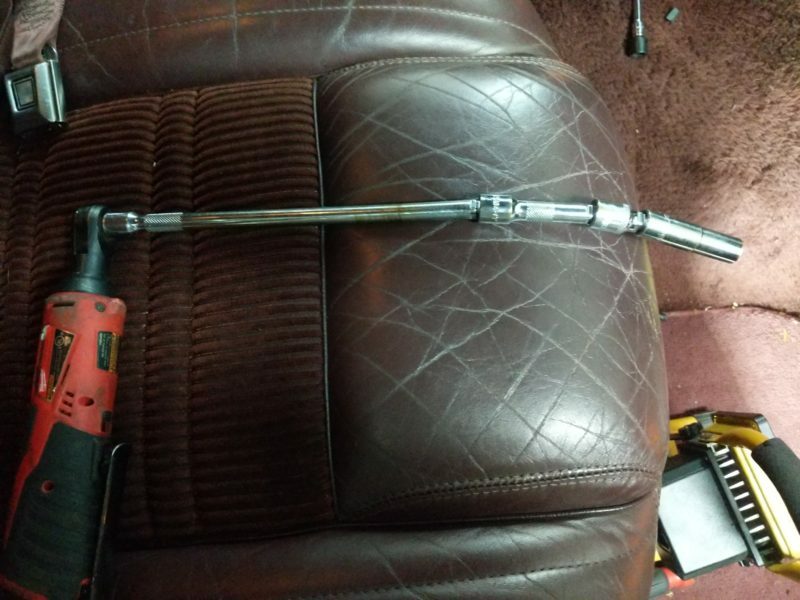 For the exhaust I found a $15 mini bike/moped muffler and some 1″ 16AWG steel tubing. 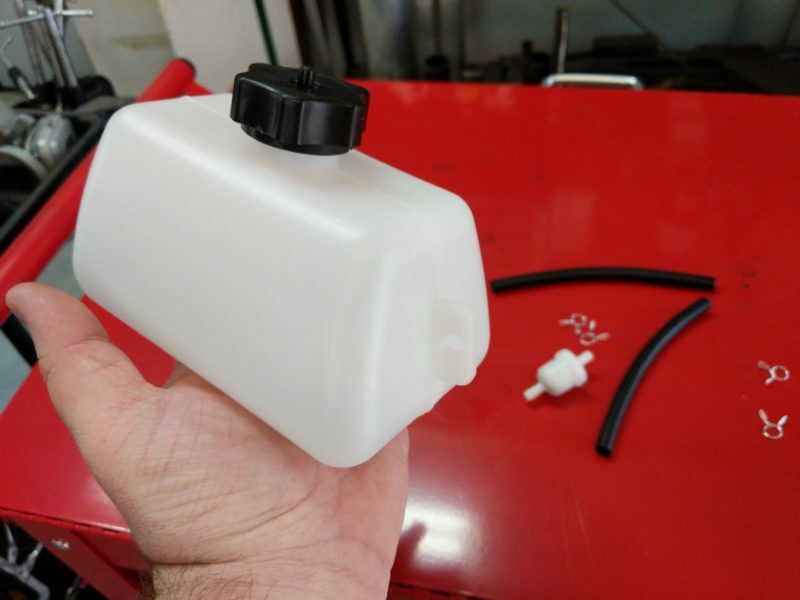 The fuel tank is a $6 plastic mini bike tank. 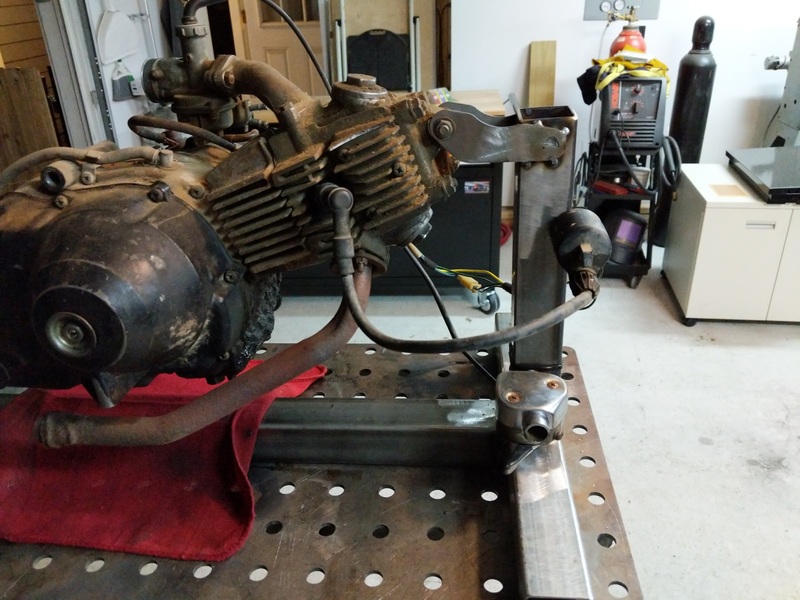 Next update on this project I hope to have those installed and the engine running on the stand. This engine needs a complete tear down as it leaks from every seal and I would rather not get my new go cart all oily!